Interior. 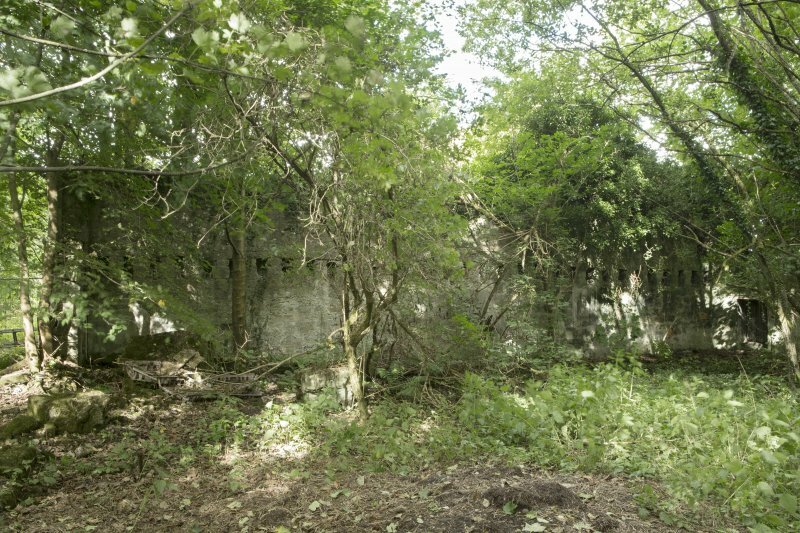 Bonded store, south wall, west end, view from north. 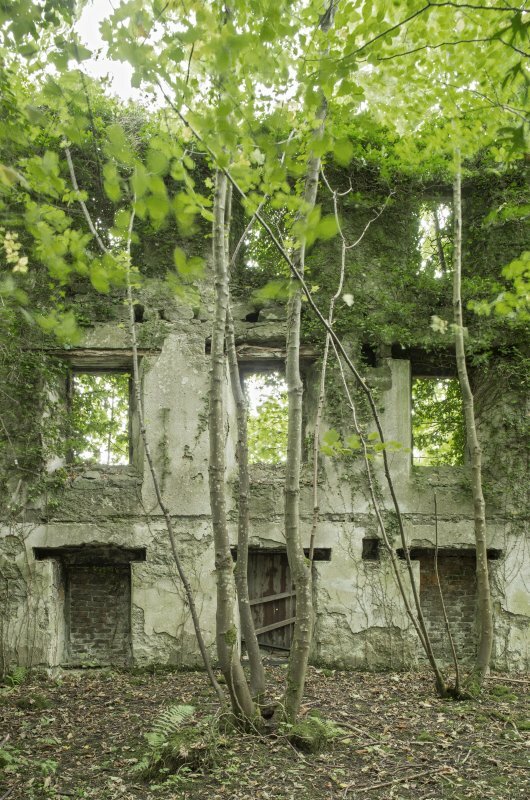 The joist holes indicate at least two upper floors. Interior. 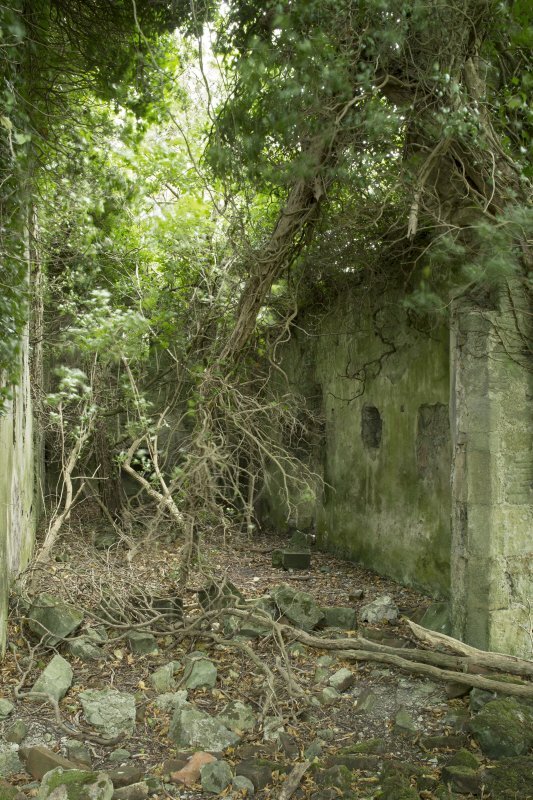 Distillery building, south range, grain milling area. View of interior from west. 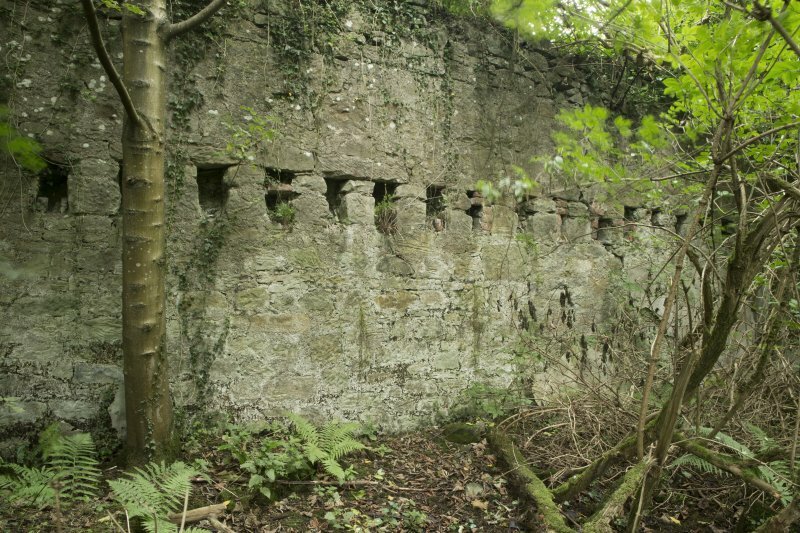 This part of the complex probably housed milling equipment to mill the kilned malted barley and the drive from the adjacent steam engine to run the milling equipment. 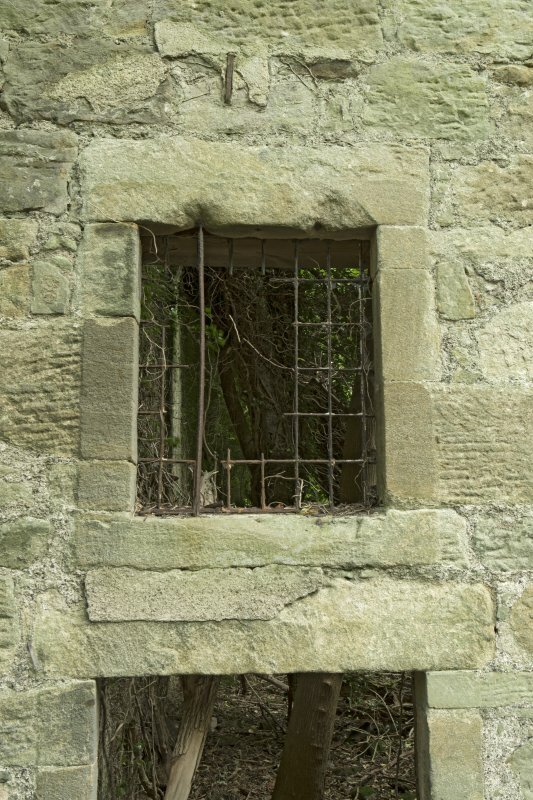 Detail of stone with central hole, door or gate support/base for (metal) upright. This appears to be out of context. 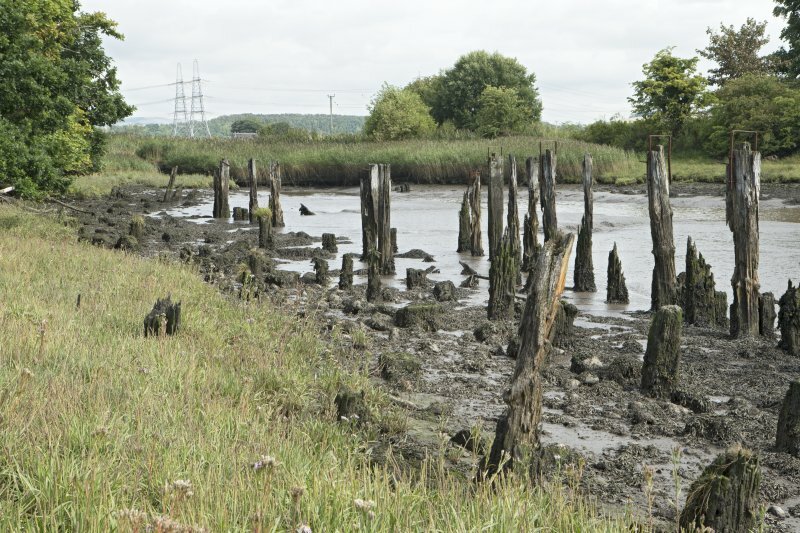 Walling on west side of estuary and remains of timber wharf posts, view from north east. 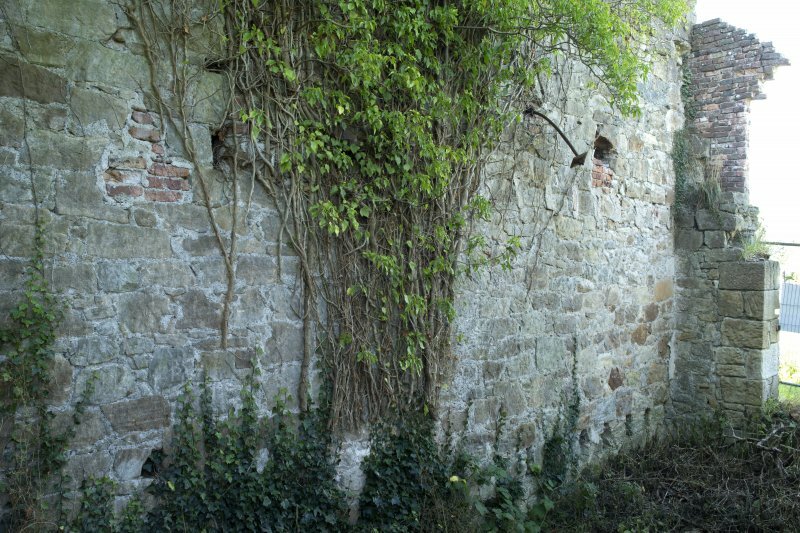 Note the lower, darker-coloured stone courses of the original quay wall. 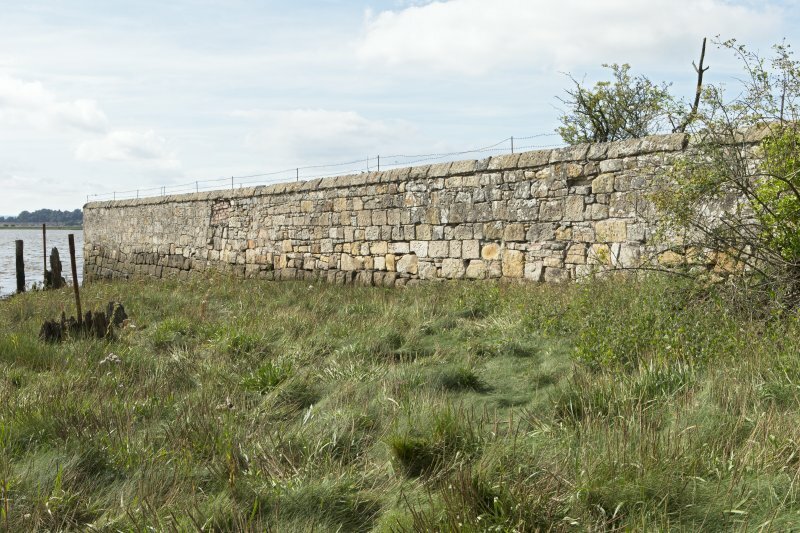 Walling on west side of estuary, view from north east. 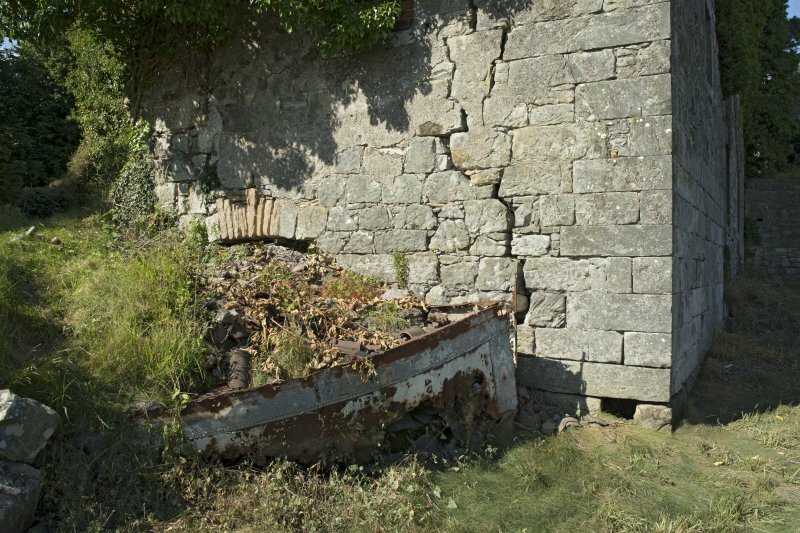 Note the lower, darker-coloured stone courses of the original quay wall. 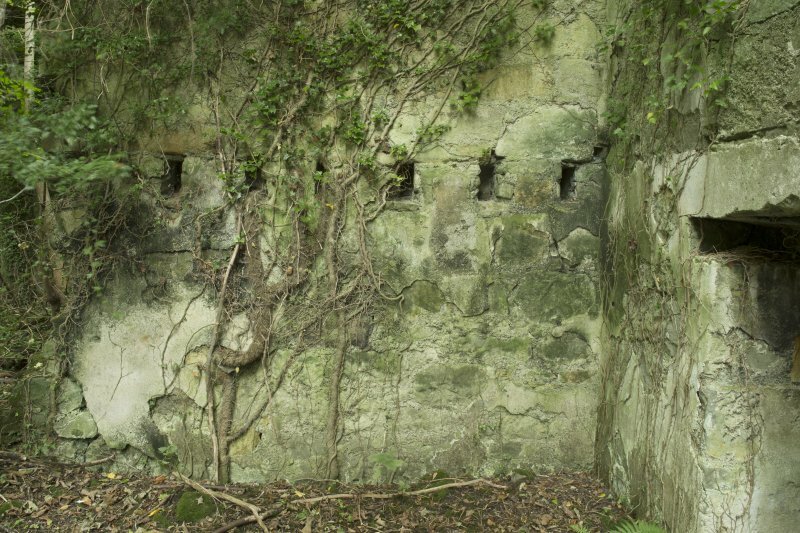 Remains of timber wharf or quay posts, detail showing bolts running horizontally. 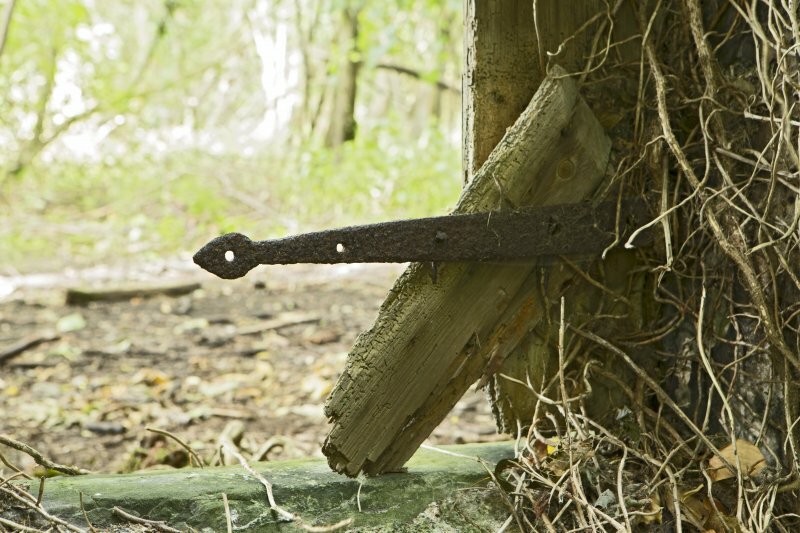 The wood into which these support bolts have been driven has decayed. 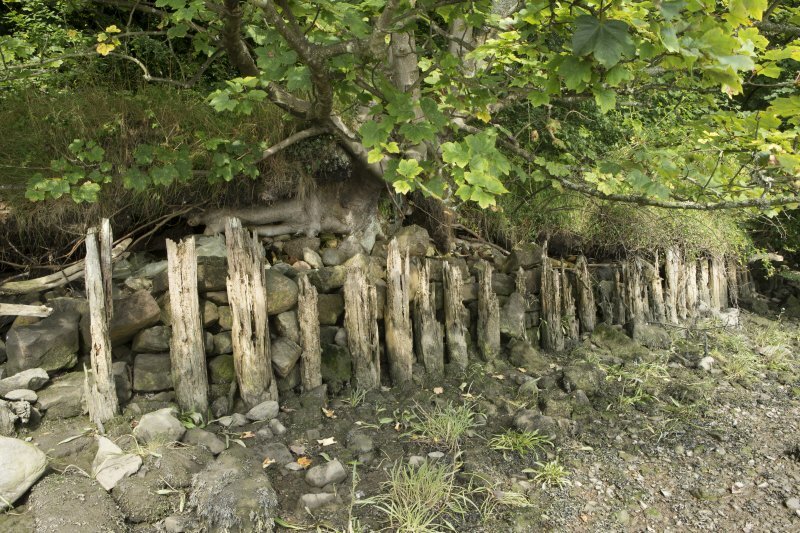 Remains of stone wall on west side of estuary, view from east against which remains of wooden piling can be seen in the silted up area. 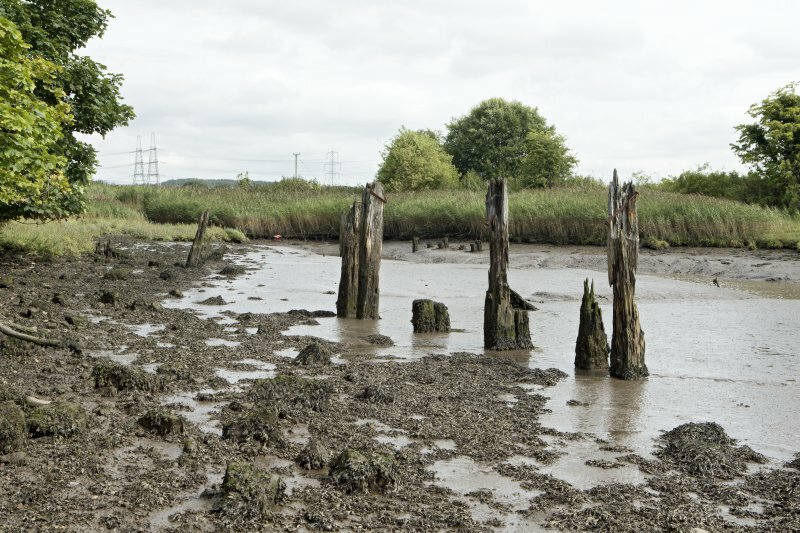 Remains of timber wharf or quay posts, view from south west. The timber quayside deck onto which cargo and materials to be shipped in and out would have been stored is now gone. Interior. 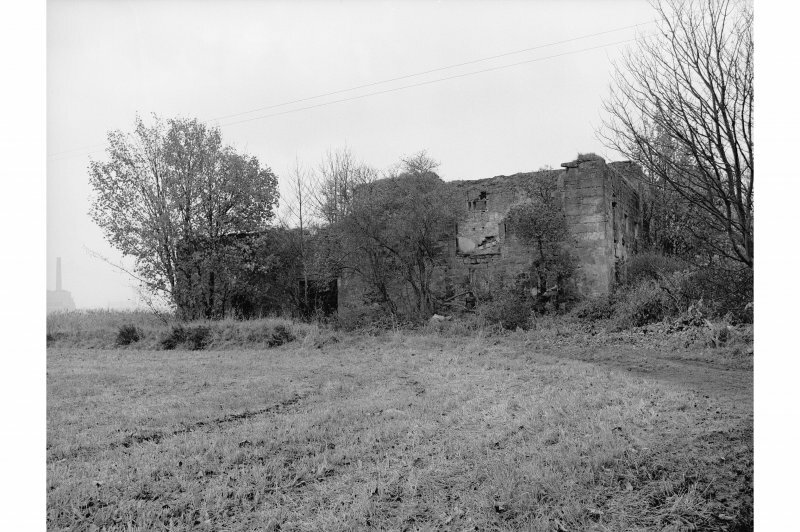 Malt barn/ store, south west corner, view from north east. 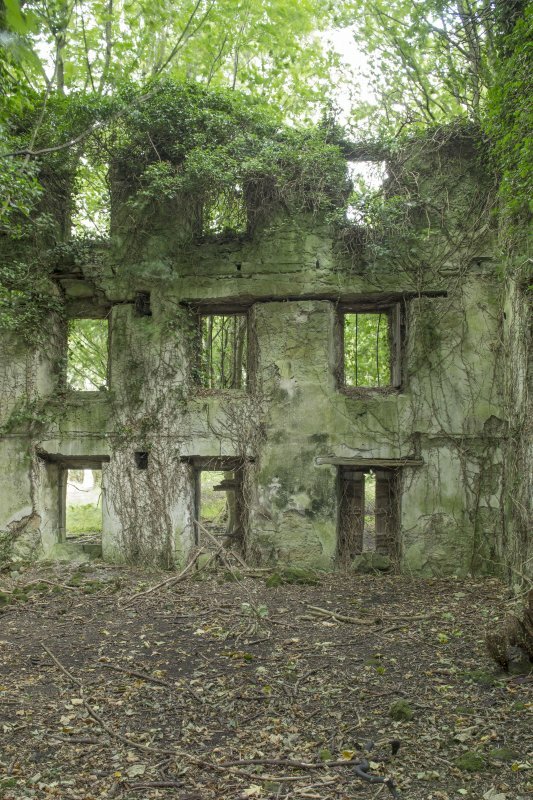 The joist holes indicate at least two upper floors. Interior. 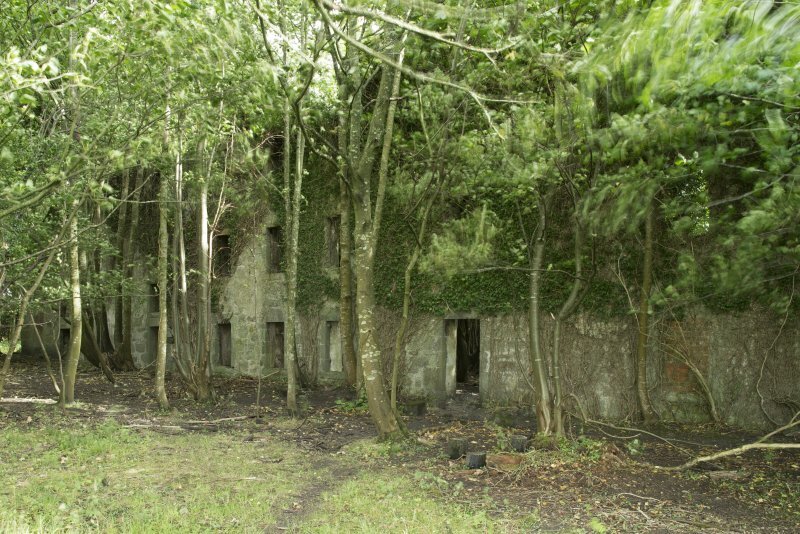 Distillery building, south range, engine house. 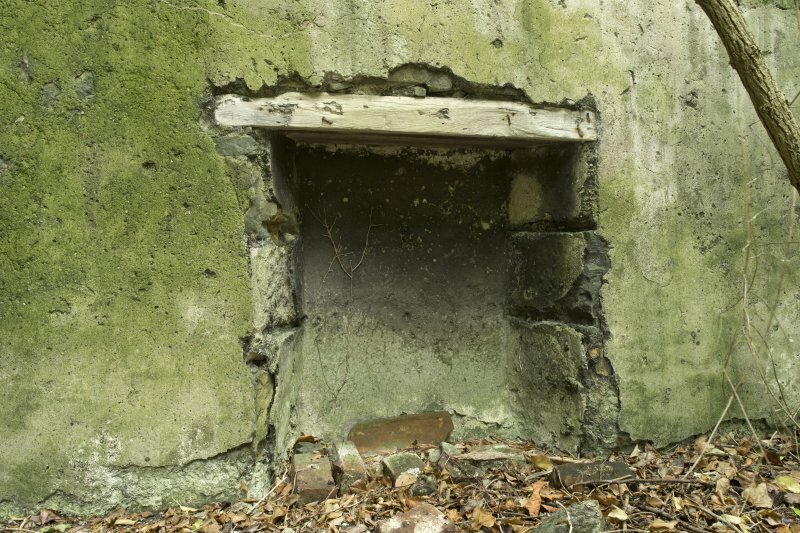 Detail of square openings in wall which would have contained the bolts which held the engine fast and allowed the axle of the flywheel to connect with the engine (now gone). Interior. 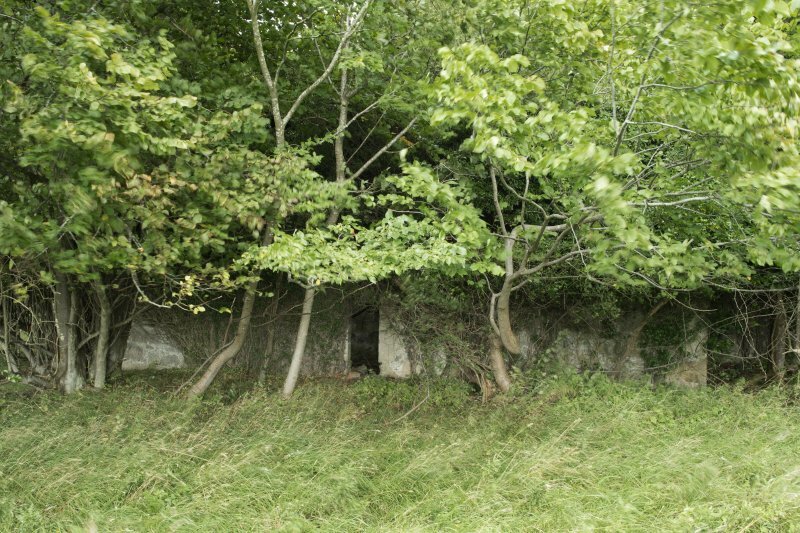 Distillery building, south range, west wall, view from east showing arched openings int grain milling area. This would have supported the overhead main drive from which a belt and pulley system would have been fitted. This would allow the driving of machinery on the ground and upper floors if necessary. 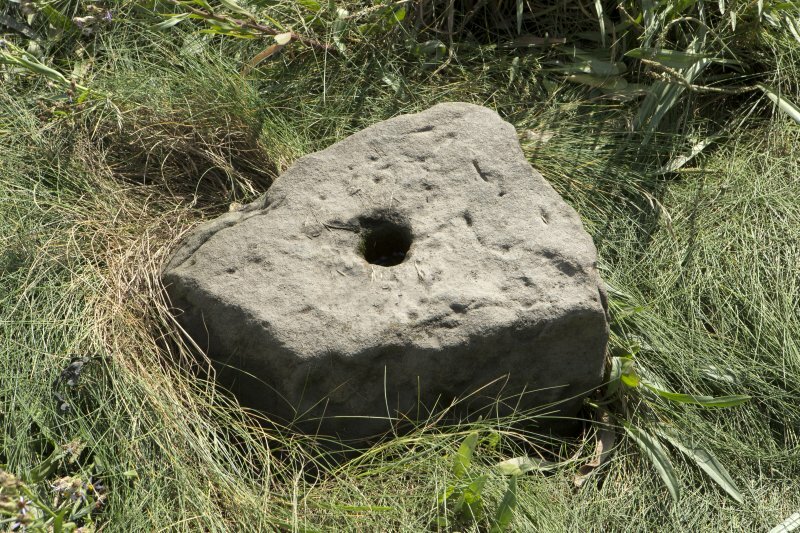 The grain miling area would have contained mill stones which ground the dried, malted barley into a meal. 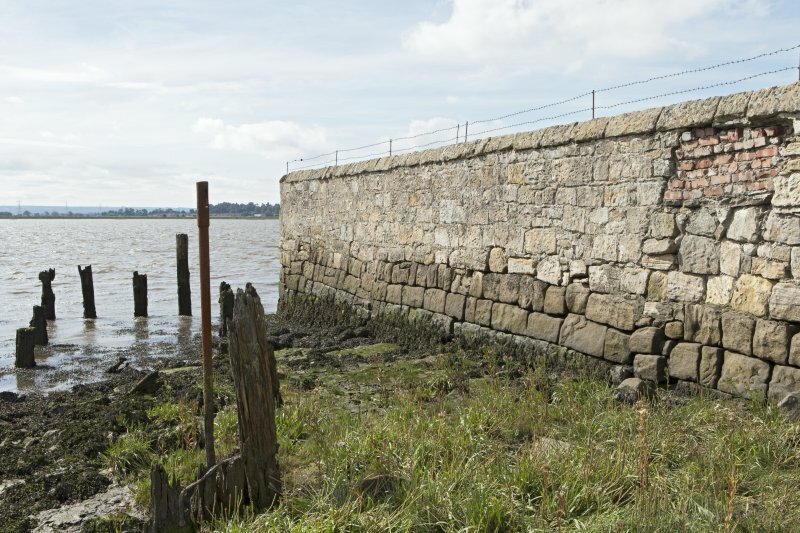 Detail of walling and remains of timber wharf or quay posts on west side of estuary. 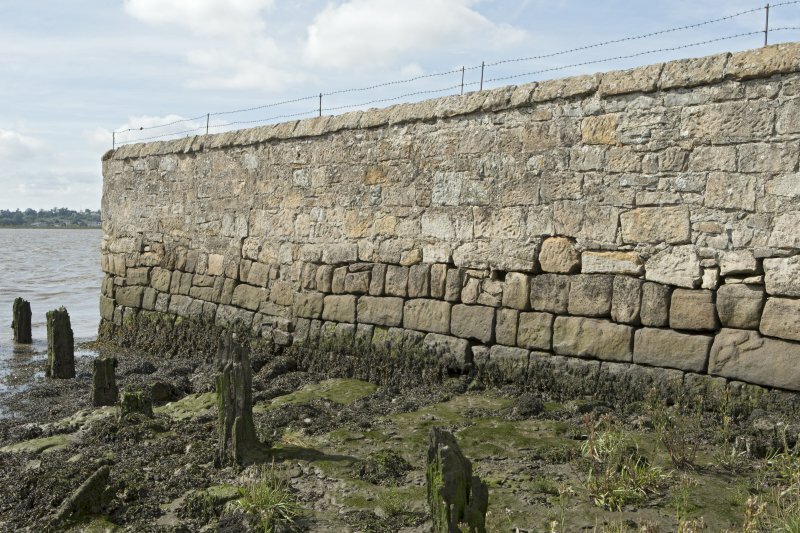 Note the lower, darker-coloured stone courses of the original quay wall. 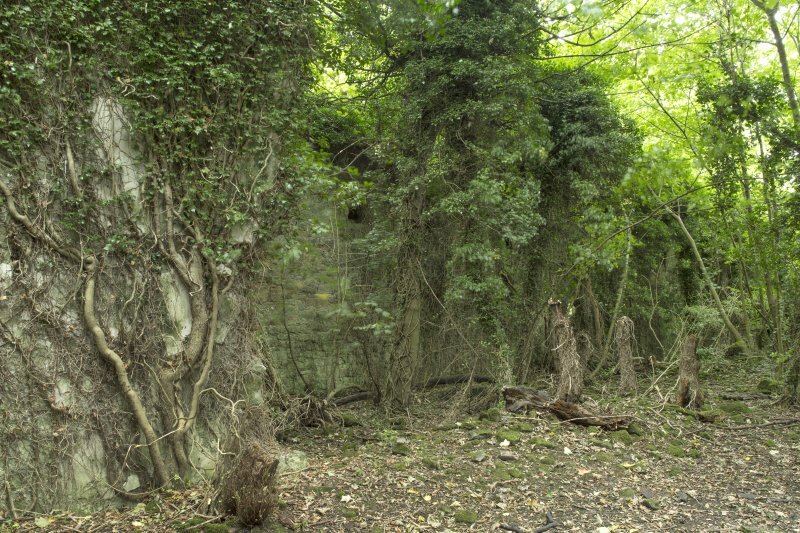 Remains of timber wharf or quay against stone wall, view from south east. 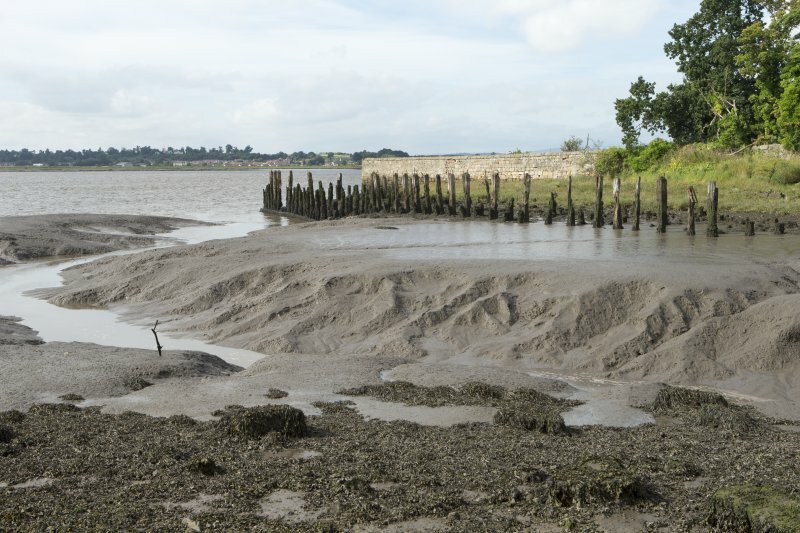 Forth estuary and remains of timber wharf or quay, view from east. The timber quayside deck onto which cargo to be shipped in and out would have been stored is now gone. 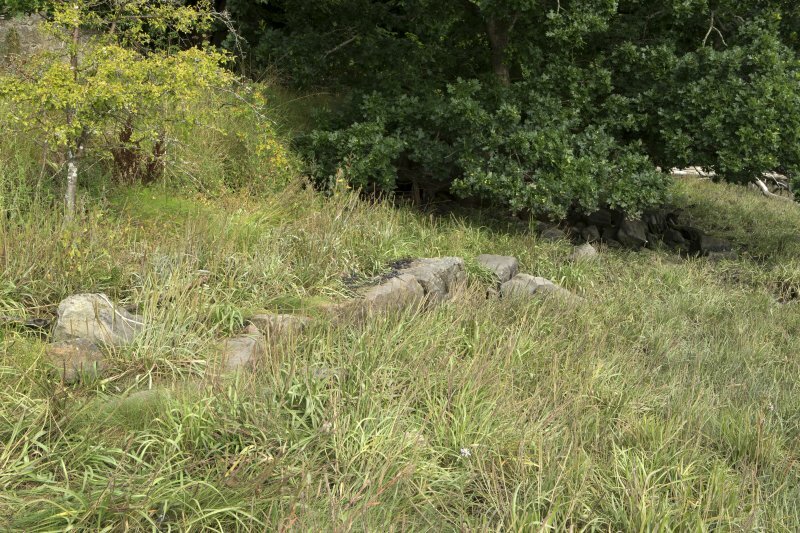 All that remains are the eroded wooden piling structure that would have supported this wooden platform. 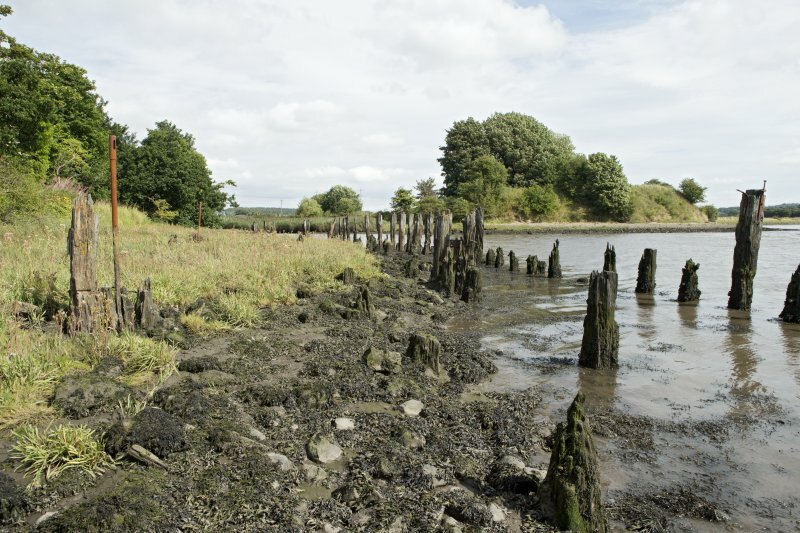 The piling formation is still visible, with rows of wooden piles designed to give maximum compressive strength. 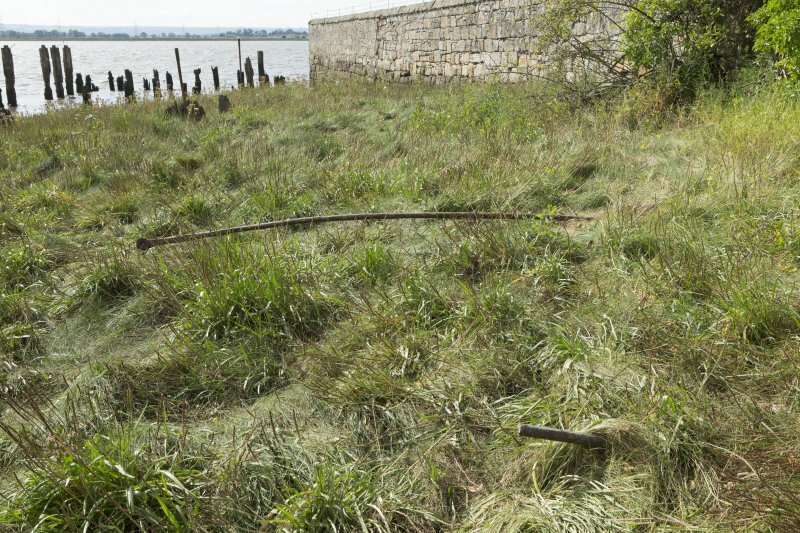 Such wooden piles will decay naturally and so the piles we see here will probably have been replaced since the 18th century when the Kennetpans Distillery was at full production (prior to 1788). Interior. 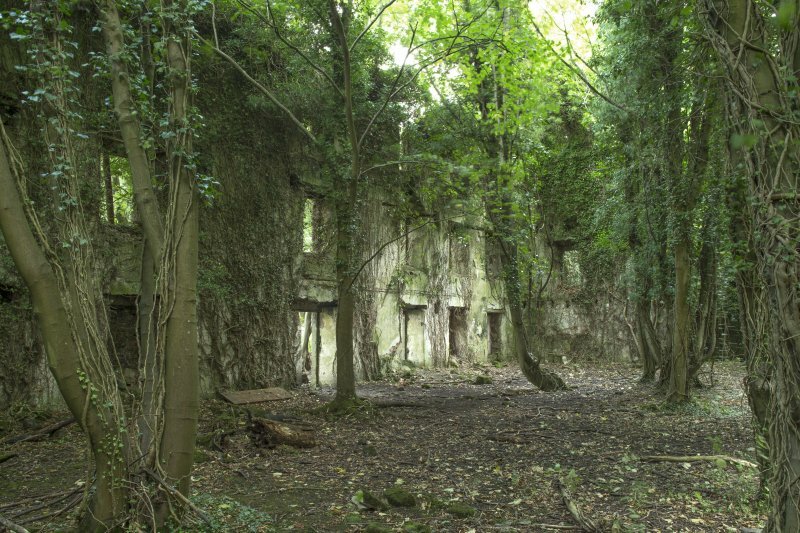 Distillery building, south block, east wall, view from west. This where the malted barley would have been ground into meal for the mashing process. The engine house (rebuilt to house the 1806 Boulton and Watt engine) is on the left. Interior. 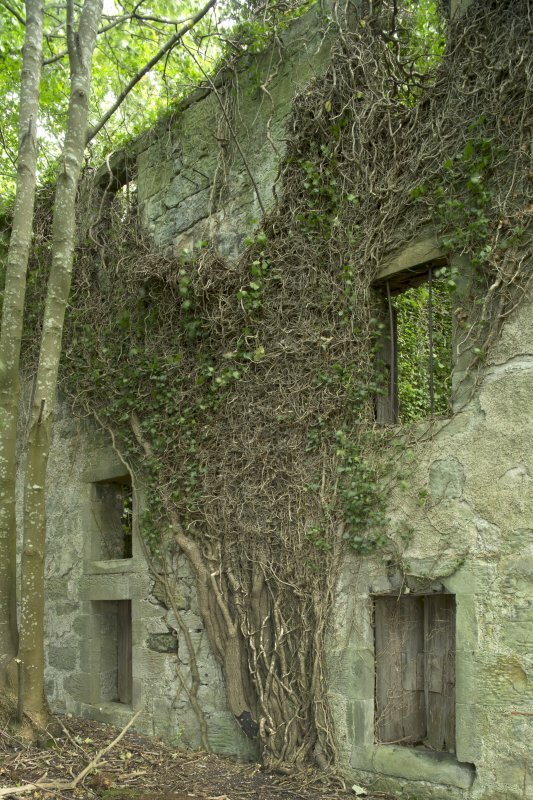 Distillery building, North wall. Interior. 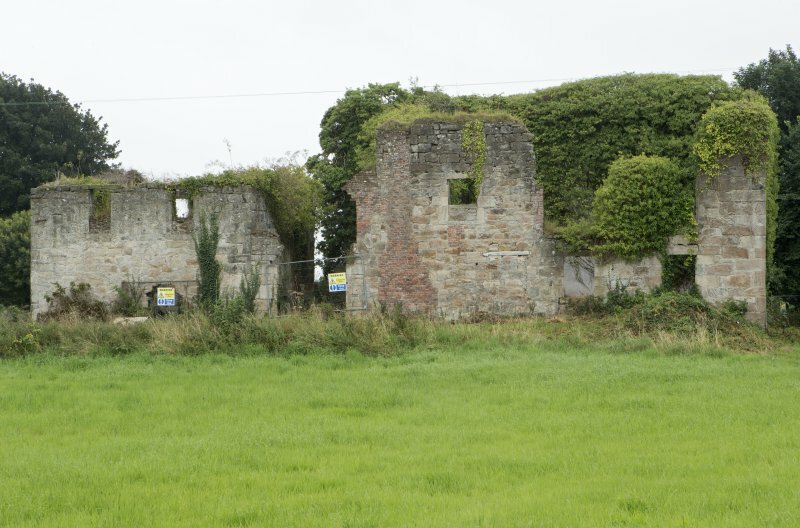 Malt barn/ store, west wall, view from north east. Interior. 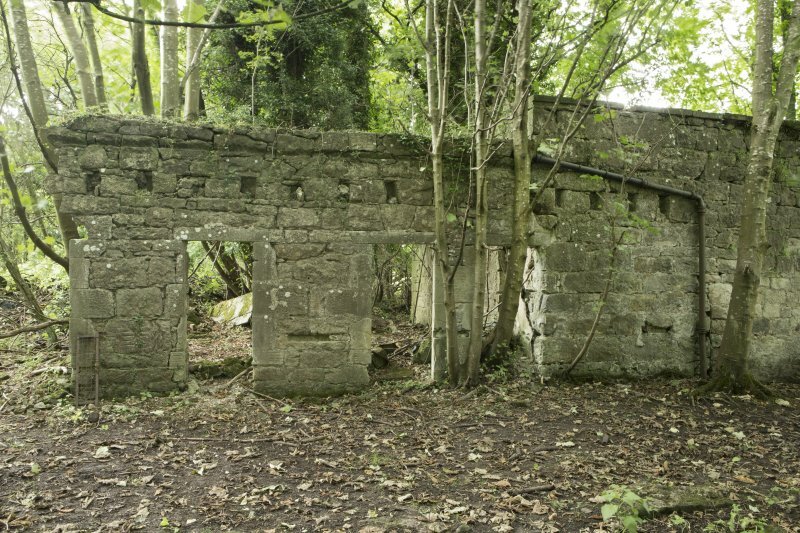 Distillery building, engine house rbuilt for 1806 engine. View from north east. The engine was used to ower the grain milling mmachinery. View of wrought iron bar and cut section of second bar in silt. These maybe steam engine drive rods. 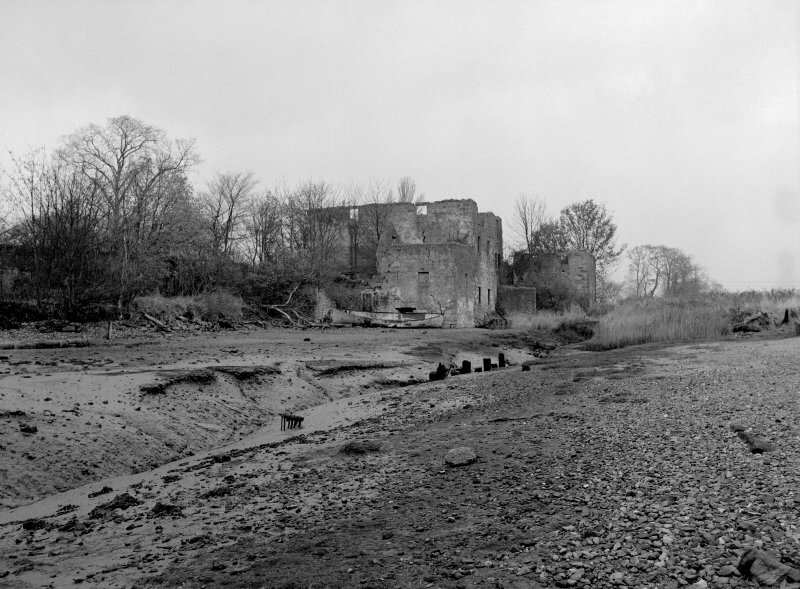 Remains of timber wharf or quay, view from north. The timber quayside deck onto which cargo to be shipped in and out would have been stored is now gone. The Kincardine and Clackamannanshire Bridges are in the background. 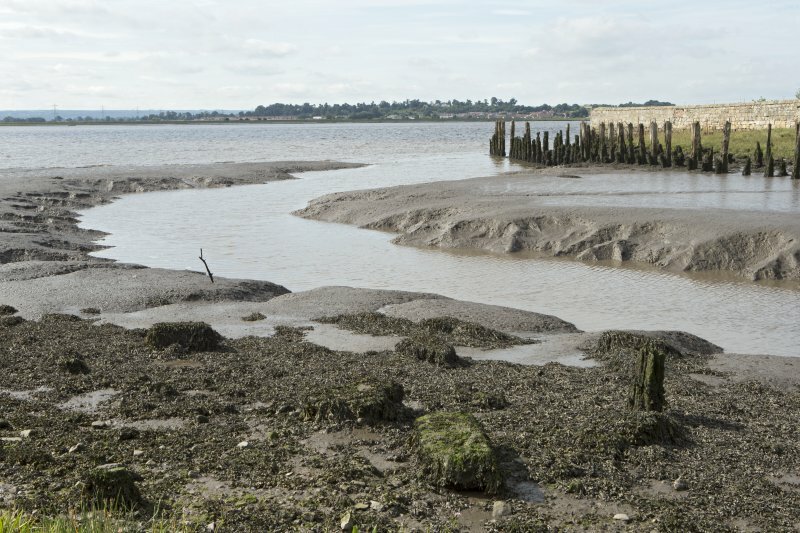 Forth estuary and remains of timber wharf or quay, general view from north east. The timber quayside deck onto which cargo to be shipped in and out would have been stored is now gone. 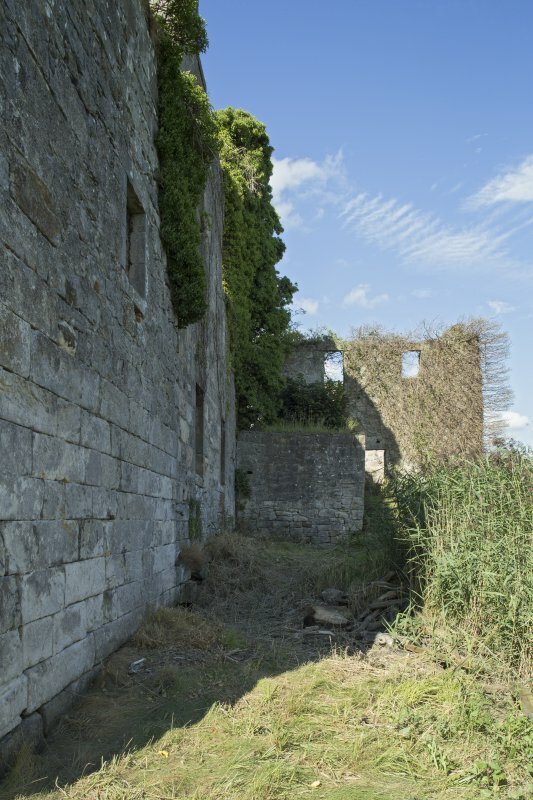 Roofless distillery building and remains of quayside or wharf area, view from south. 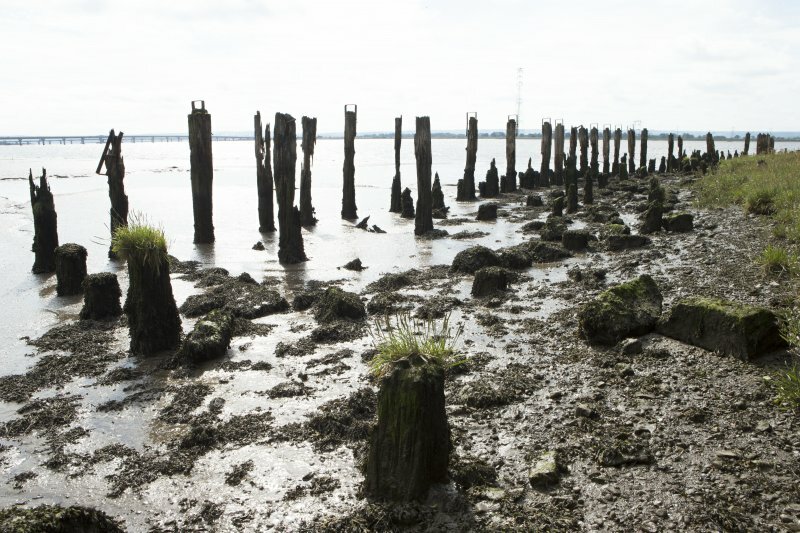 Forth Estuary and remains of timber wharf (level quayside area), view from north east. Malt barn/ store. 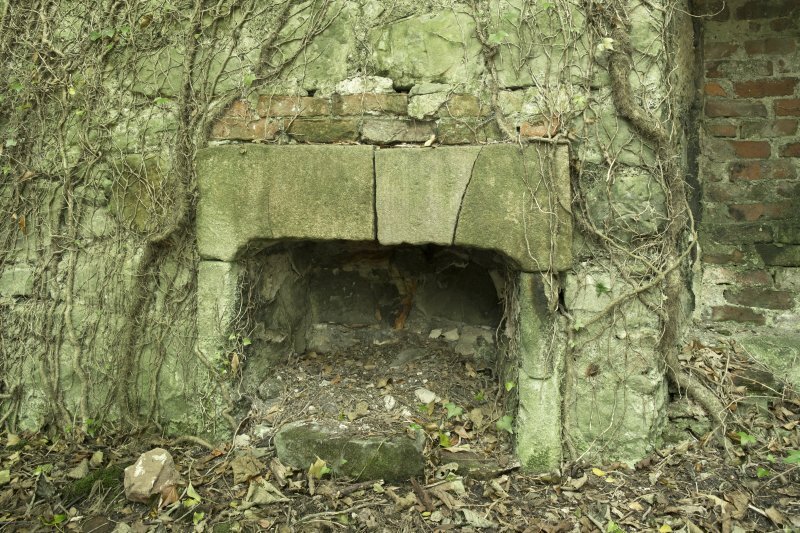 Fragments of the original lime render is visible. 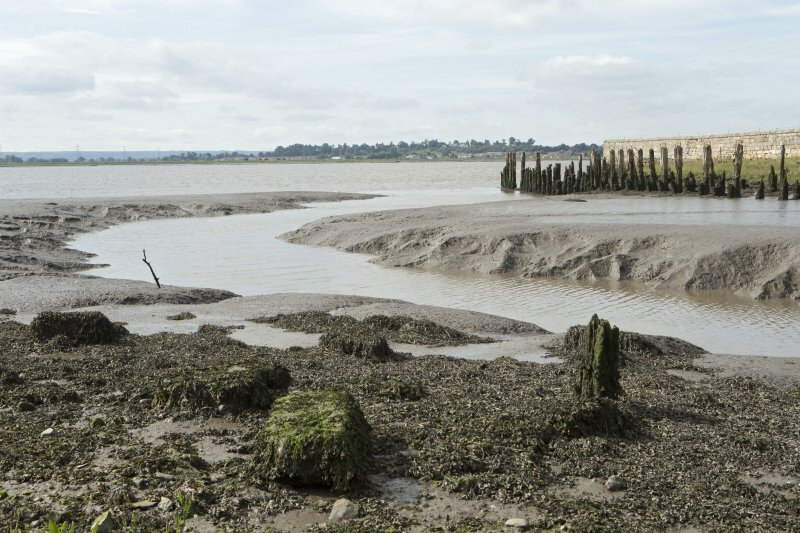 Forth estuary and remains of timber wharf or quay, view from north east. The timber quayside deck onto which cargo to be shipped in and out would have been stored is now gone. 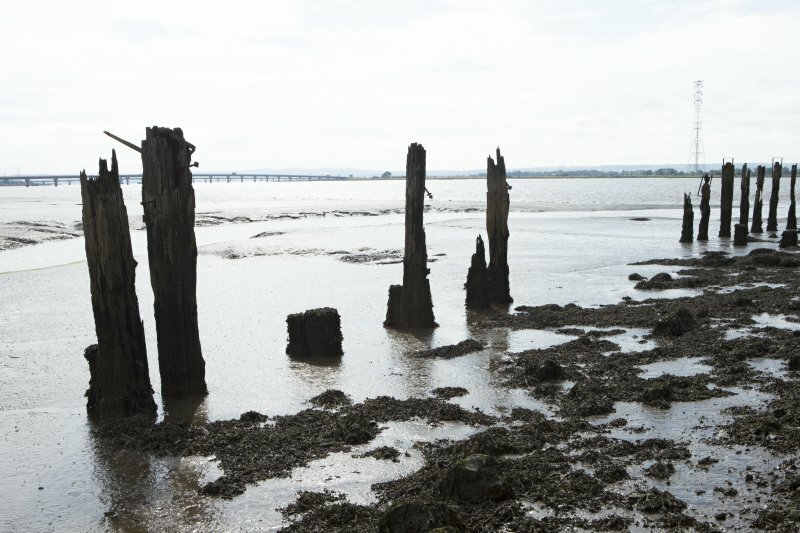 Forth Estuary and remains of timber wharf or quayside, view from north east. The timber quayside deck onto which cargo to be shipped in and out would have been stored is now gone. Interior. 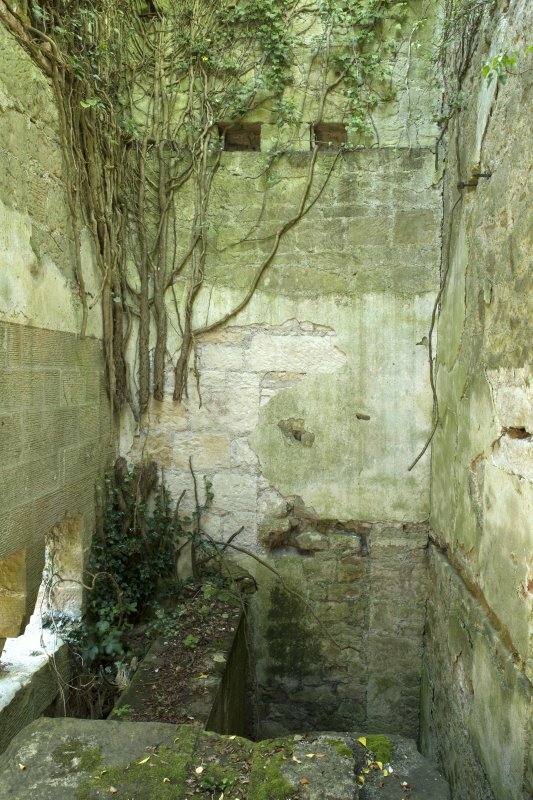 Bonded store showing the lime rendered walls and the splayed window recesses to maximise loght. The store wuld have been kept dark and cool. 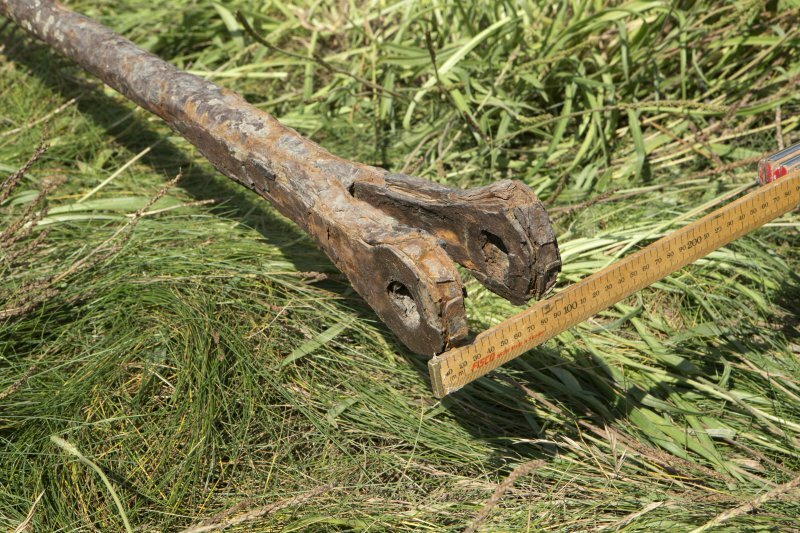 Detail of split head of iron bar with holes (including scale). 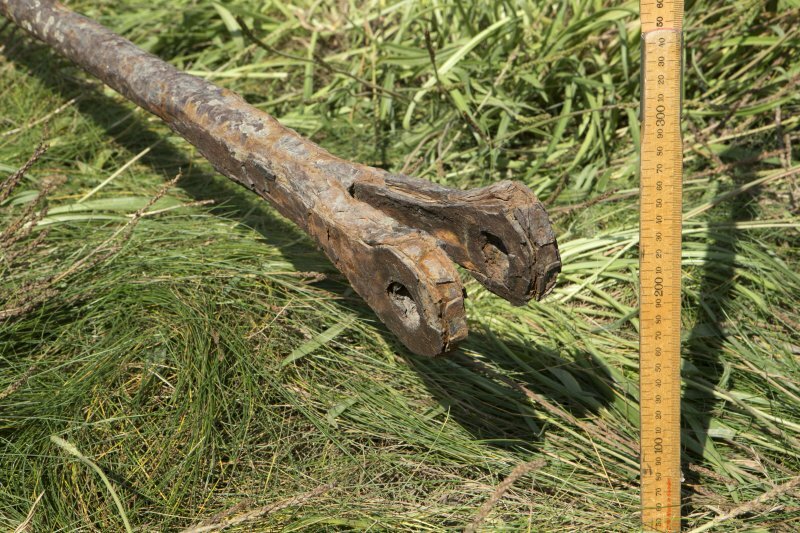 This may be part of a steam engine drive rod. 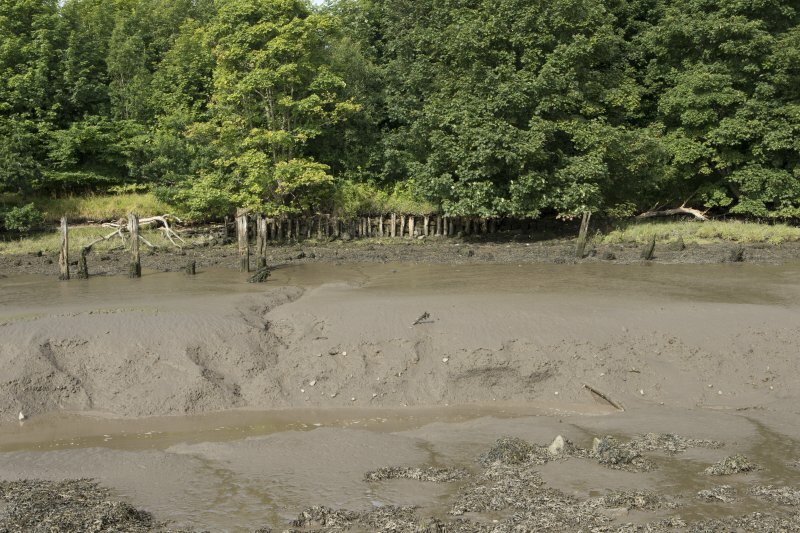 Detail of wrought iron bar buried in the silt. This may be a drive rod for a steam engine. 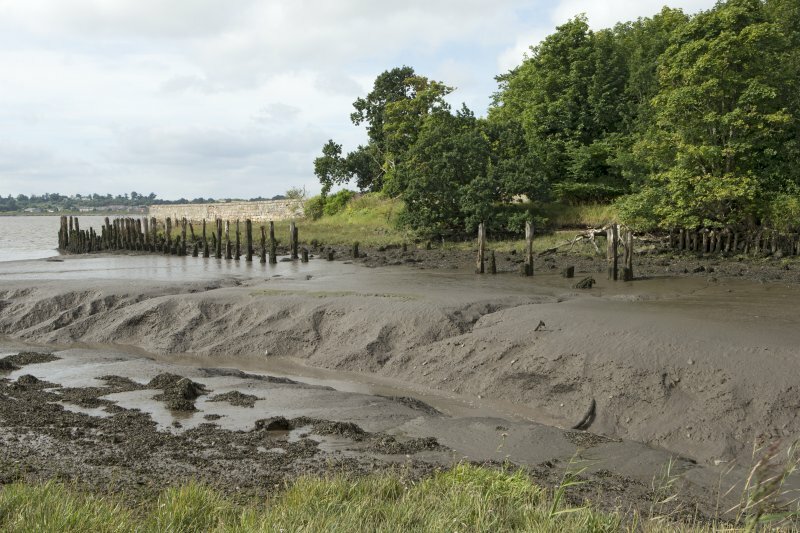 Remains of timber wharf or quay posts, view from north.The timber quayside deck onto which cargo and materials to be shipped in and out would have been stored is now gone. 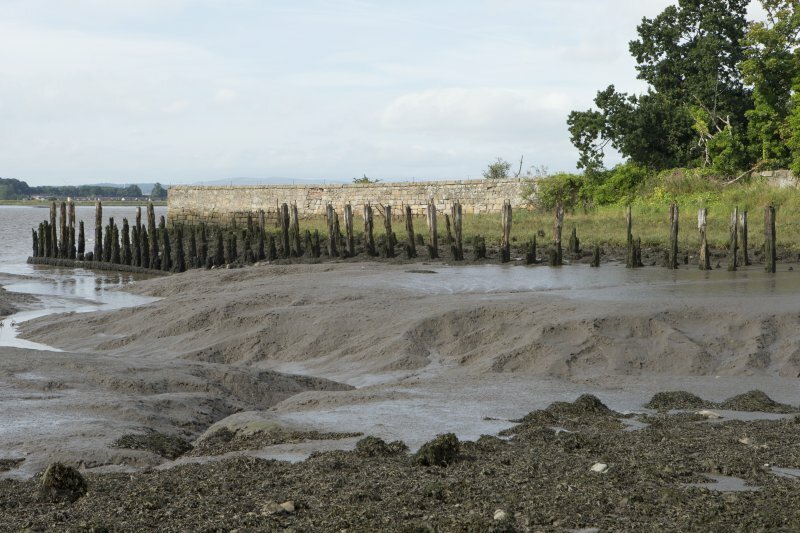 Forth estuary and remains of timber wharf or quay, view from north east.The timber quayside deck onto which cargo to be shipped in and out would have been stored is now gone. Interior. 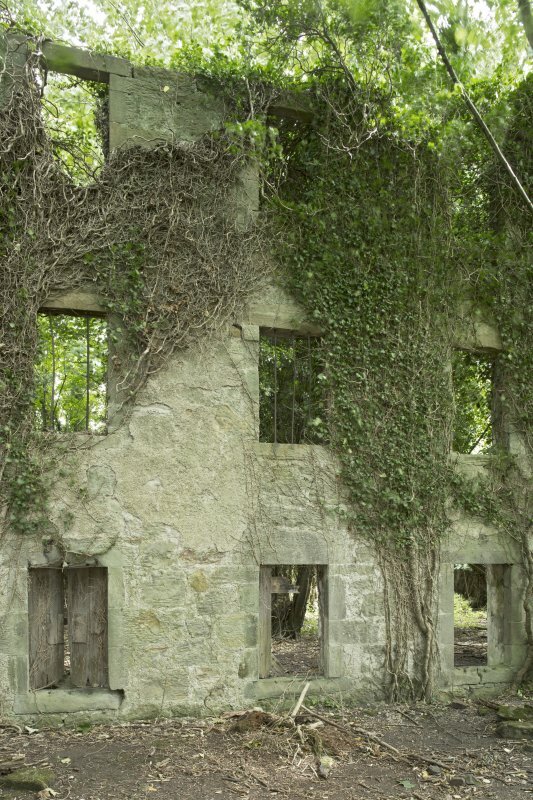 Distillery building, engine house. View from plinth at east end. 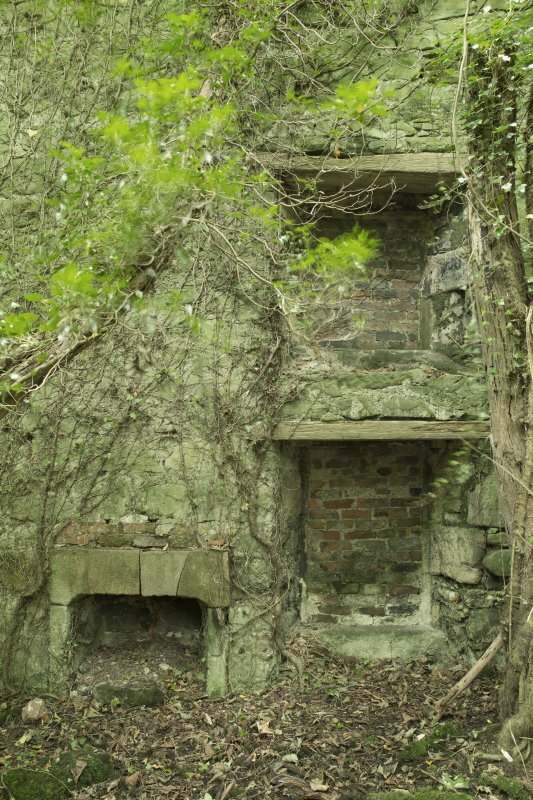 The engine wld have been bolted to this masonry foundation to keep it steady and to allow access for maintenance and repair. Interior. 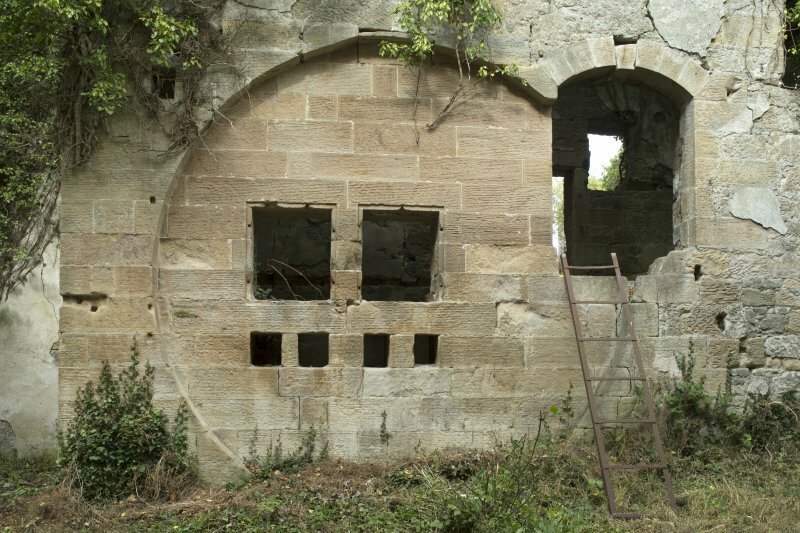 Distillery building, south range, view of circular recess for flywheel and adjacent arched opening to engine house. This would have supported the overhead main drive from which a belt and pulley system would have been fitted. 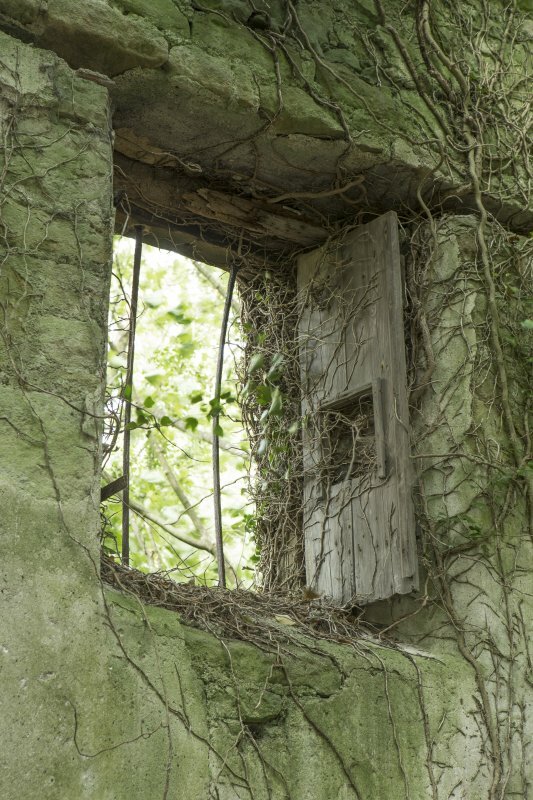 This would allow the driving of machinery on the ground and upper floors if necessary. 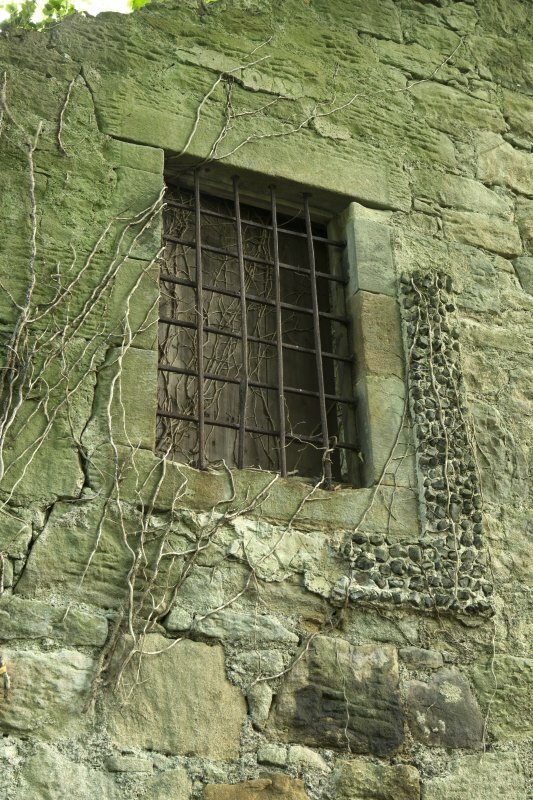 The grain miling area would have contained mill stones which ground the dried, malted barley into a meal. Detail of split head of iron bar with bolt holes - may be part of a drive rod for a steam engine. 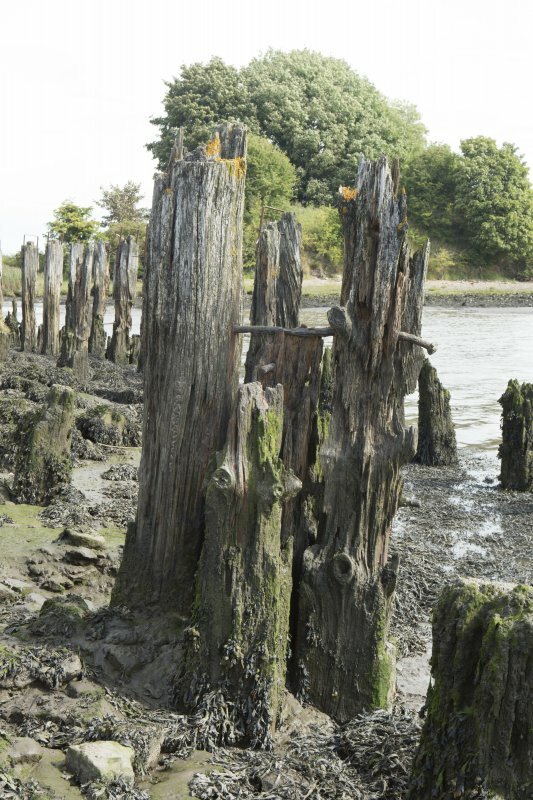 Remains of timber wharf or quay posts. Detail showing bolts running horizontally. 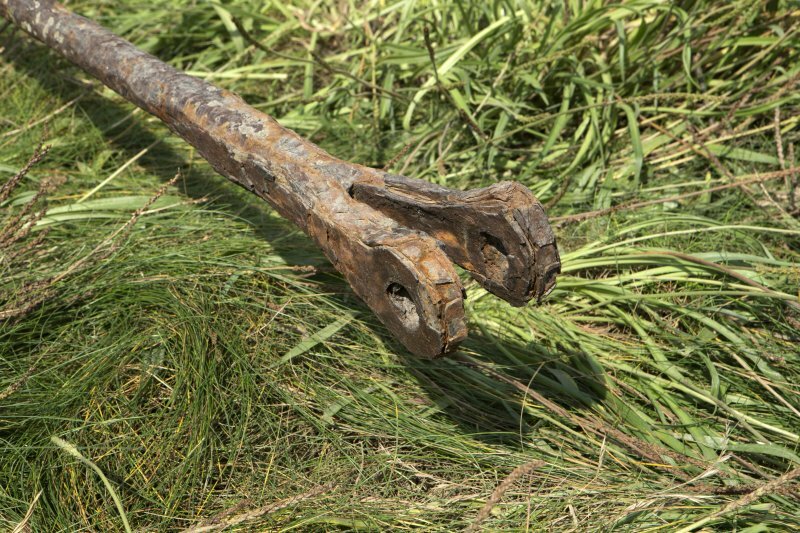 The wood into which these support bolts have been driven has decayed. 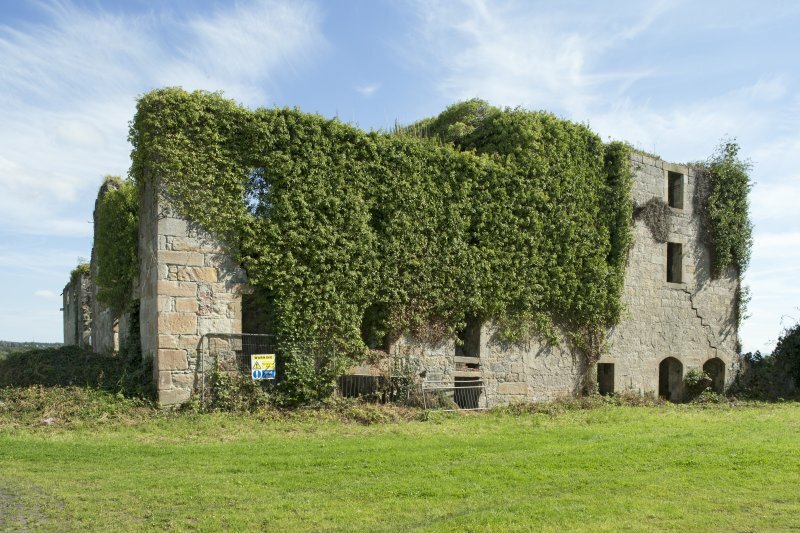 The distillery, built in the 1770's and closed in 1825, is located within designed landscape Kennetpans. No changes appear to have occurred to the remains since the HS report of 1991. 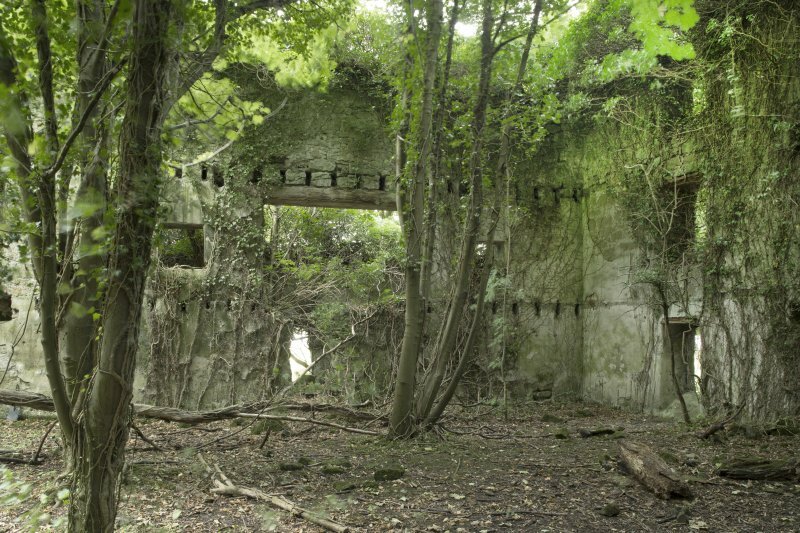 The site is in a ruinous condition and is very overgrown. 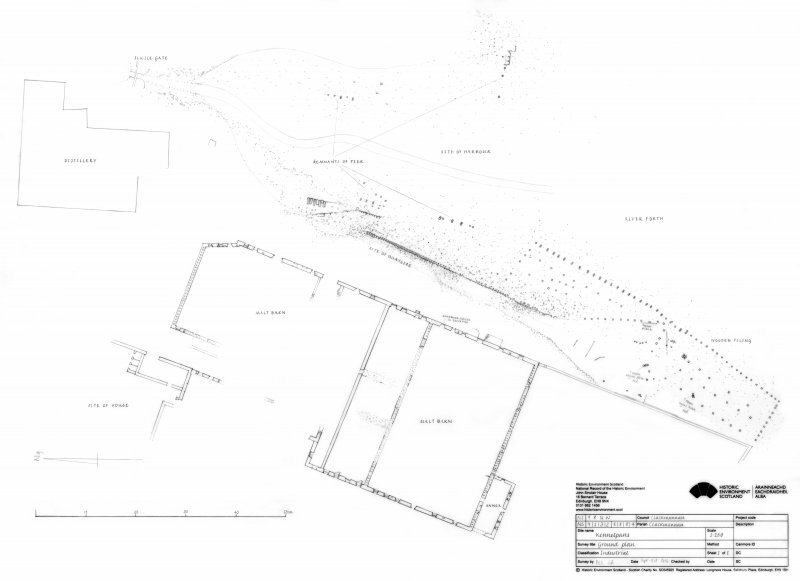 Site recorded by GUARD during the Coastal Assessment Survey for Historic Scotland, 'The Firth of Forth from Dunbar to the Coast of Fife' 24th February 1996. 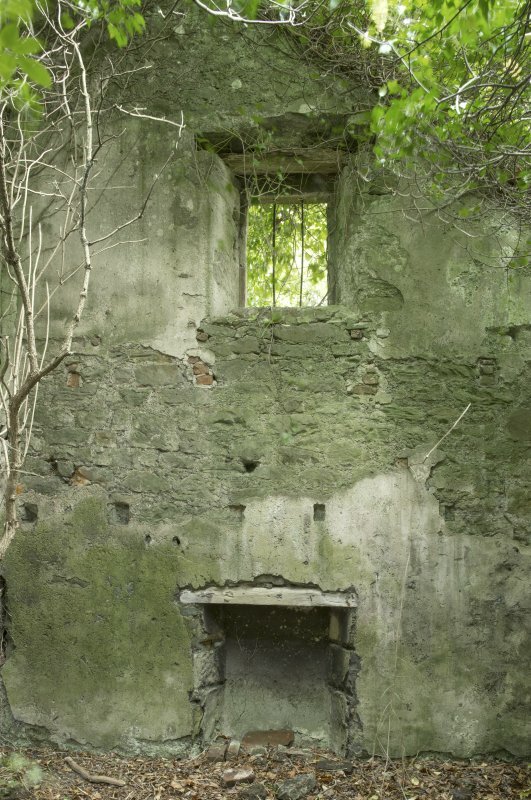 Kennetpans Distiillery NS913890, late 18th century. 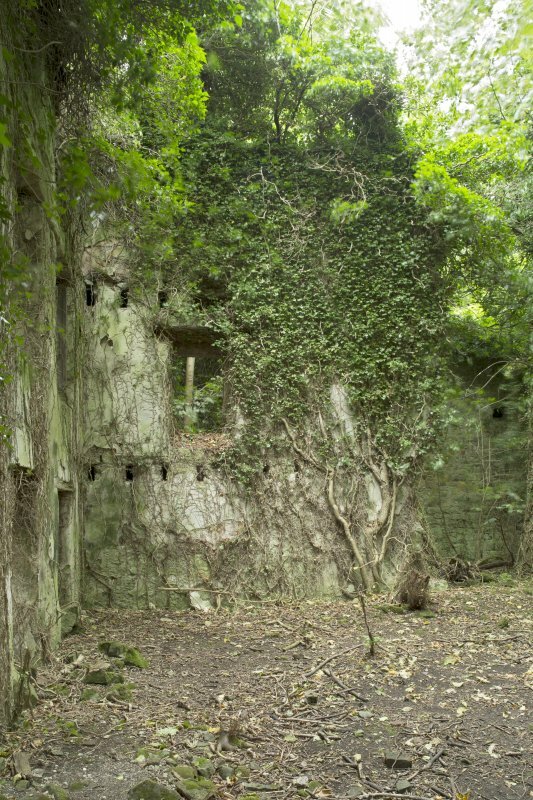 A remarkable group of ruins of a once extensive complex. 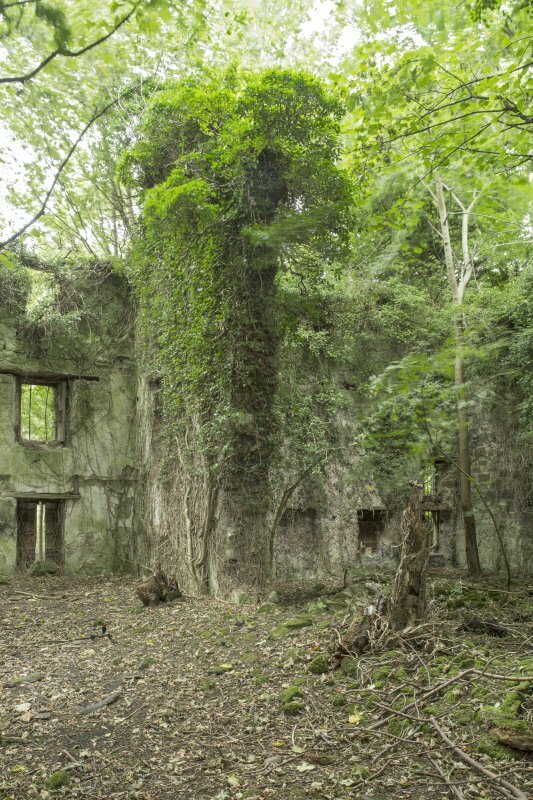 The main block was 3 storeys high, and there are lower buildings, now overgrown, ranged along a creek. 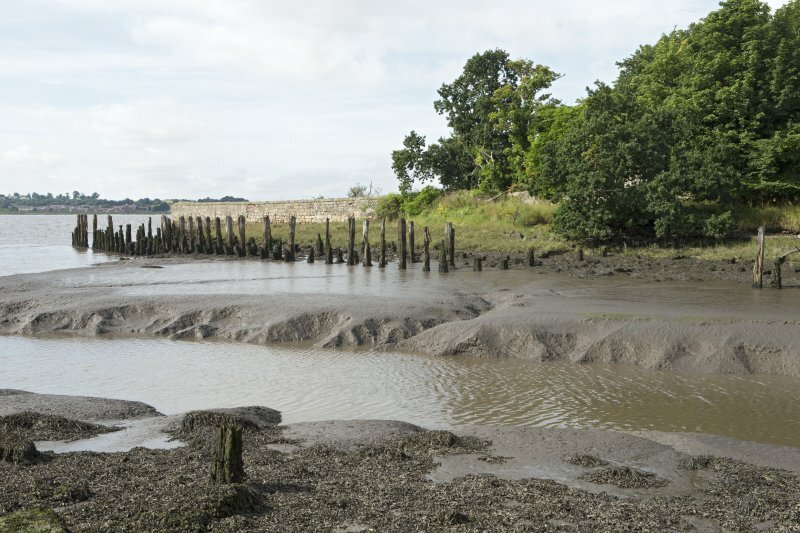 The wooden piles of a large pier areclearly visible at low tide , and an artificial mound on the east bank of the creek may have been a dump for ballast. The passing of the Lowland Licence Act in 1788 required all Scottish distillers working for the English markets had to give12 months notice. In effect meant no whisky to be distilled for a year. Wash stills had to be greater than 200 gallons capacity and an extra duty for all spirits sent to England for rectification was levied..John Stein and others ceased trading at this point. From 1790-94, there were no legal whisky exports from Scotland to England. 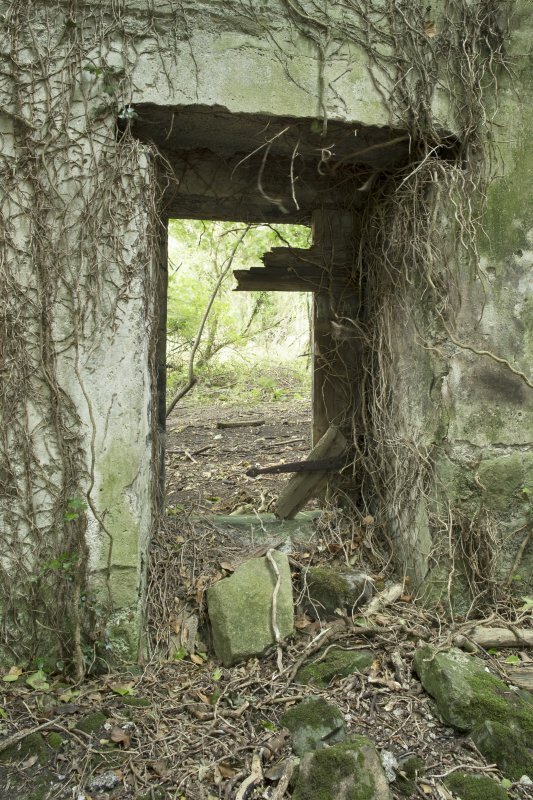 The distillery was 'said to have been founded before 1777 by John Stein; seq[uestered] 1788; John Stein jun., 1775-1825. 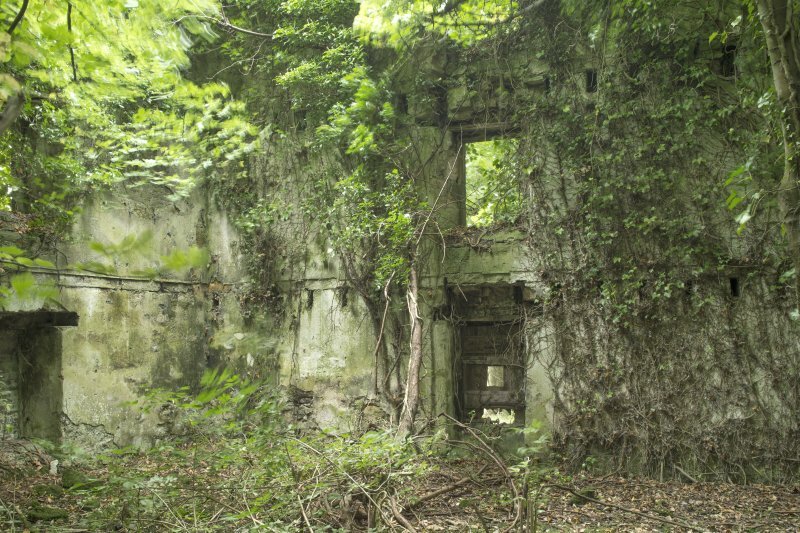 Extensive ruins'. 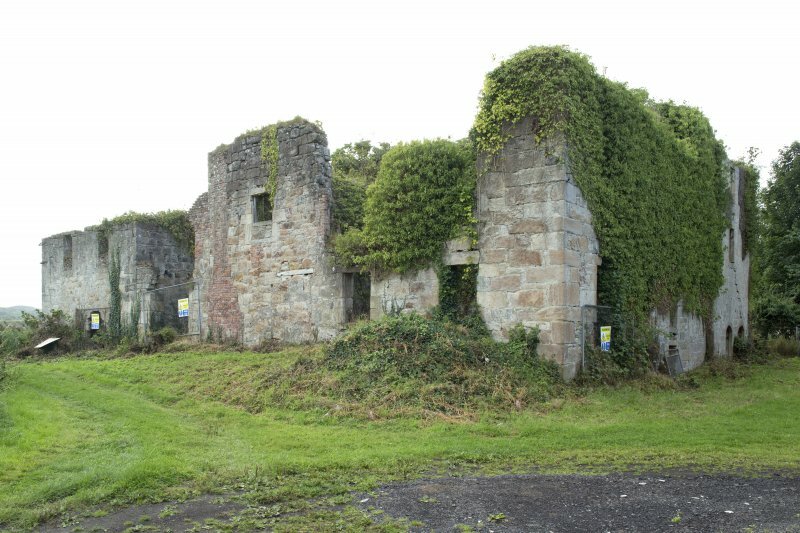 Kilbagie and Kennetpans Distilleries were developed by two brothers, James and John Stein in 18th century, the distilleries reaching their peak in the 1780s. 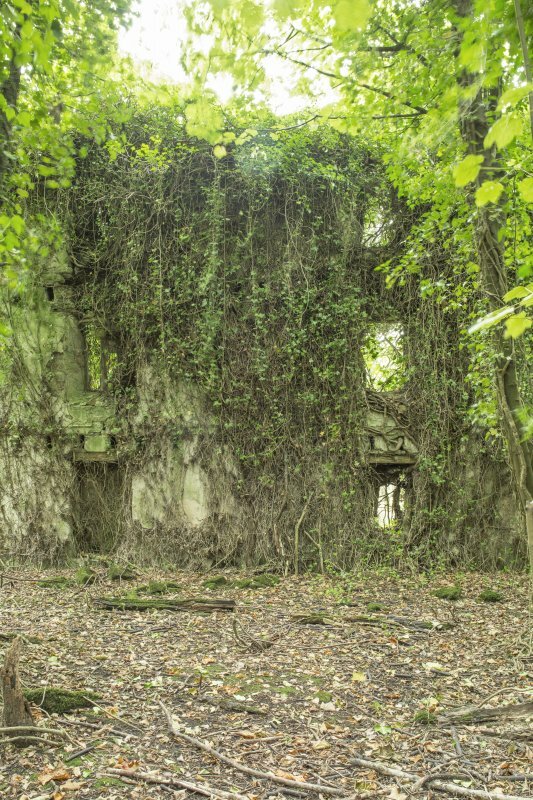 The Kennetpans remains as it was at its abandonment in 1825. The excise duty paid by the two distilleries in the 1770s was in excess of the 'the whole of the land tax for Sciotland at that date'. The 'first Bolton and Watt steam engine erected in Scotland at Kennetpans Distillery' is noted by Stewart. 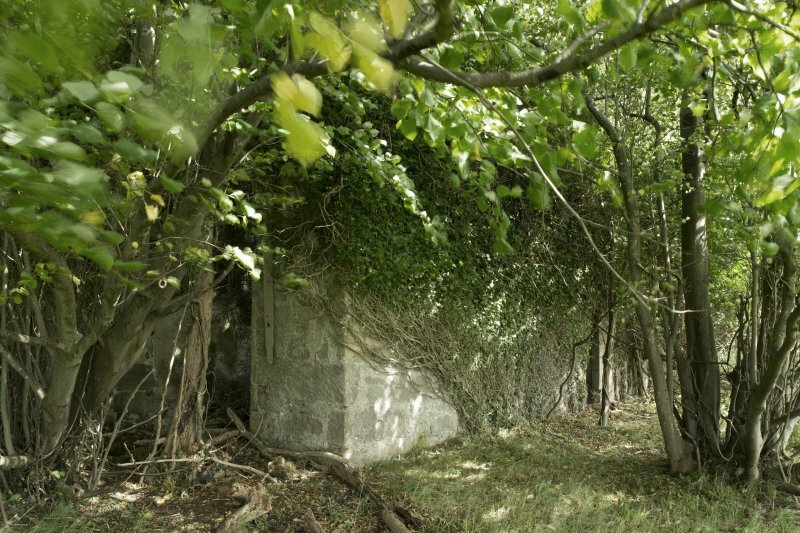 The canal of 1780 and the later wagonway linked Kennetpans and Kilbagie. 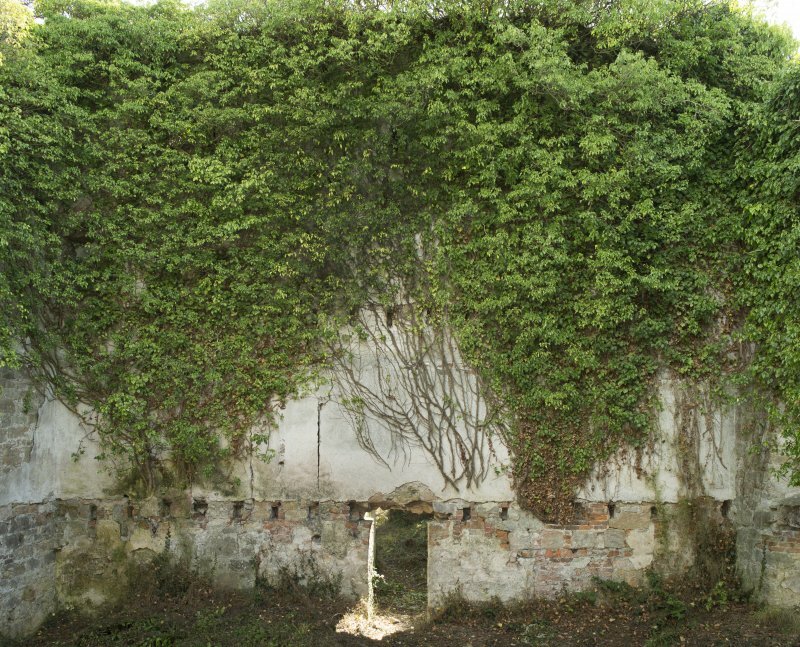 Stewart also states that one of the 'first continuous stills...was installed and Kilbagie' presumably soon after its invention in 1826 (by Robert Stein). 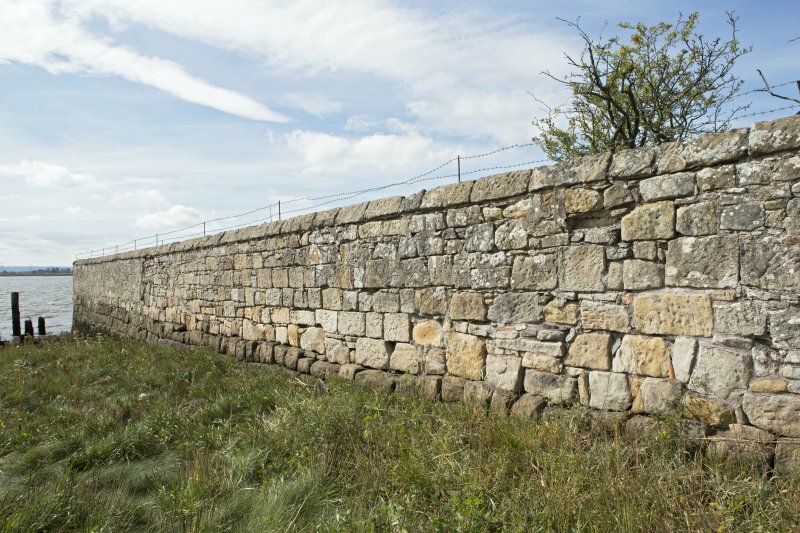 Thehis still design was later refined by Aeneas Coffey in 1831.The measures of excessive customs barriers to trading Scottish whisky in England led to both distilleries going bankrupt, although Kilbagie did carry on as a whicky distillery. 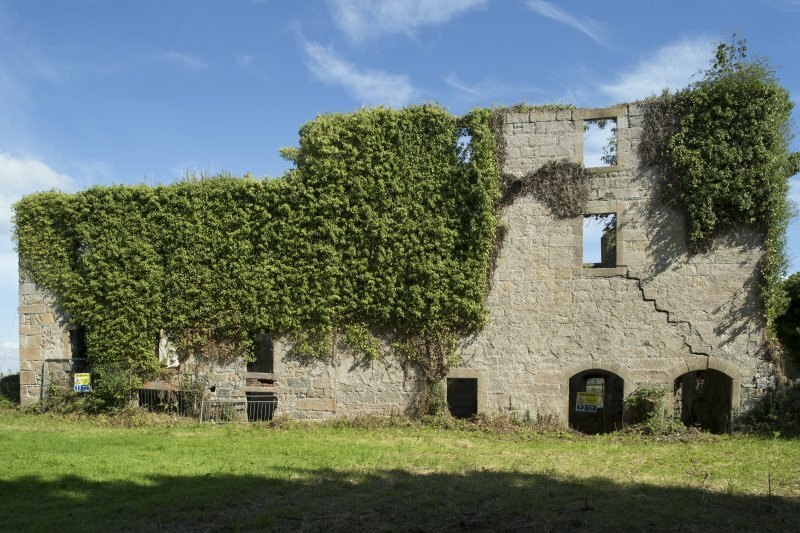 AOC Archaeology Group was commissioned by Historic Environment Scotland to undertake an historic building survey of the ruined Kennetpans Distillery building, Clackmannanshire in advance of conservation work on the structure. The work follows on from a test pit exercise undertaken in 2015 which identified original floor levels ca. 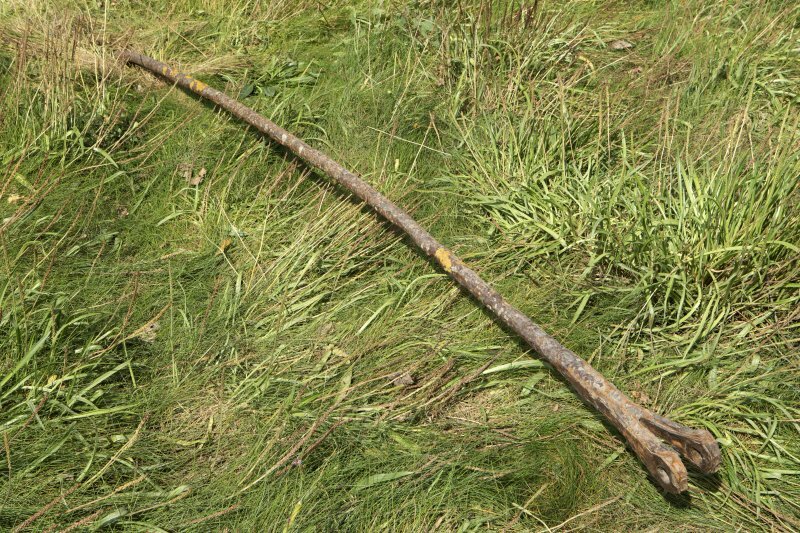 0.5m - 1m below the present ground surface. 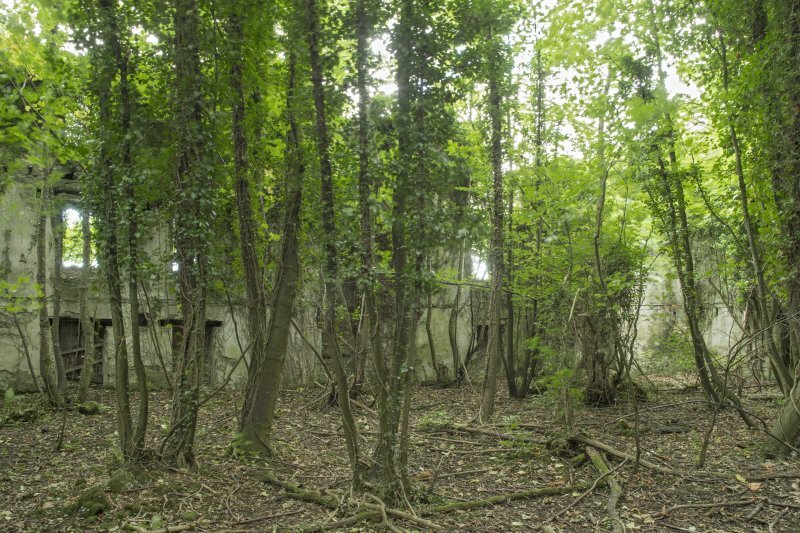 It also follows on from an extensive vegetation clearance of the structure in October 2016. 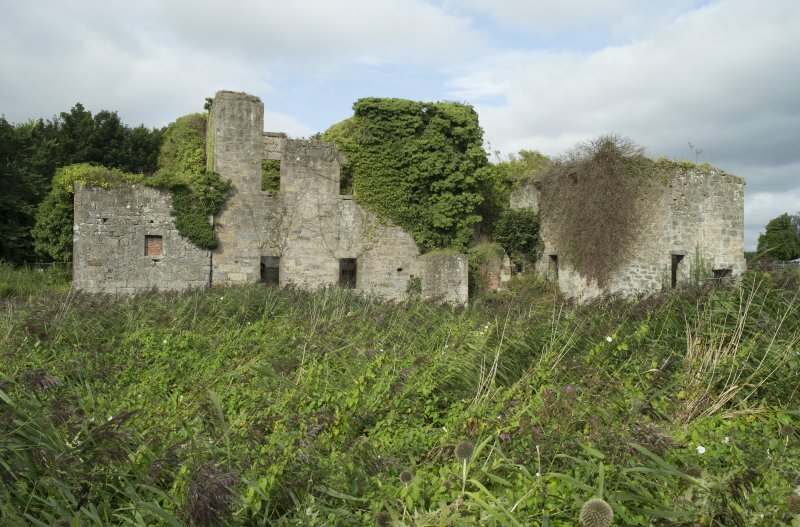 Kennetpans Distillery was occupied from the 1720s - 1820s and was owned (and later leased) by the Stein family throughout its history. 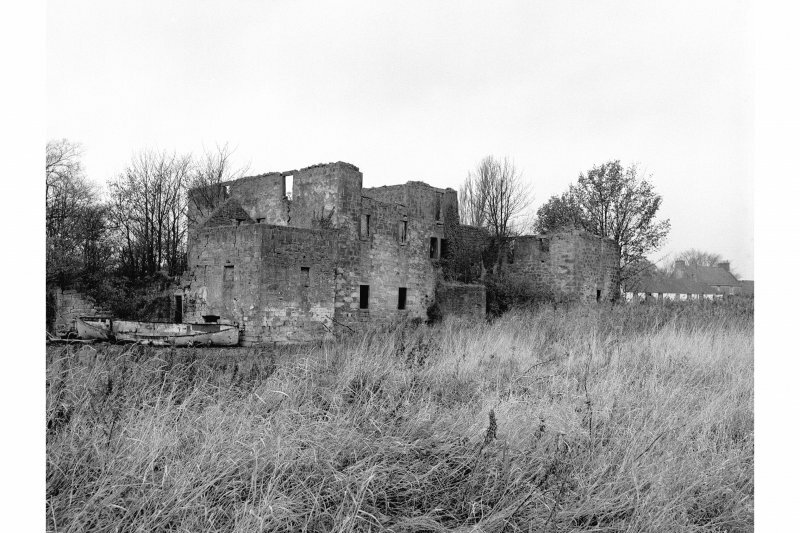 By the 1780s, the distillery, together with its sister distillery Kilbagie a few miles to the north-east, Kennetpans was the largest distillery in Scotland. 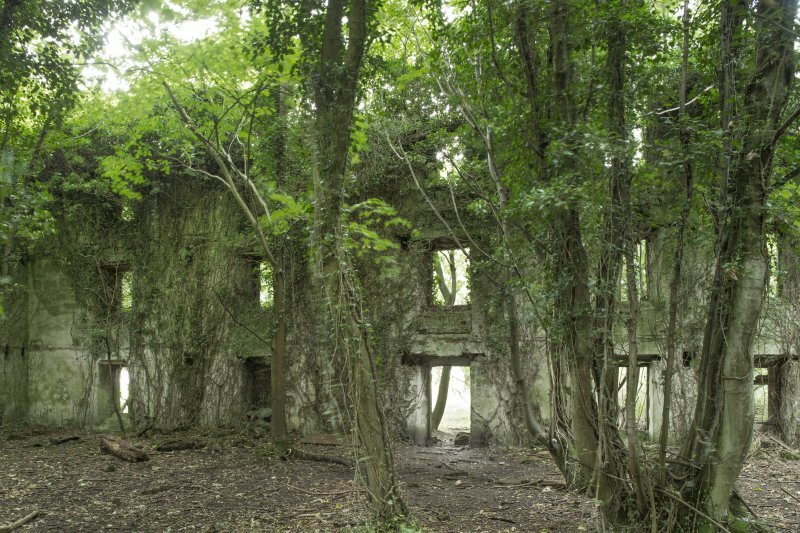 The site ceased production and was abandoned by the mid-1820s and has remained a derelict site ever since. 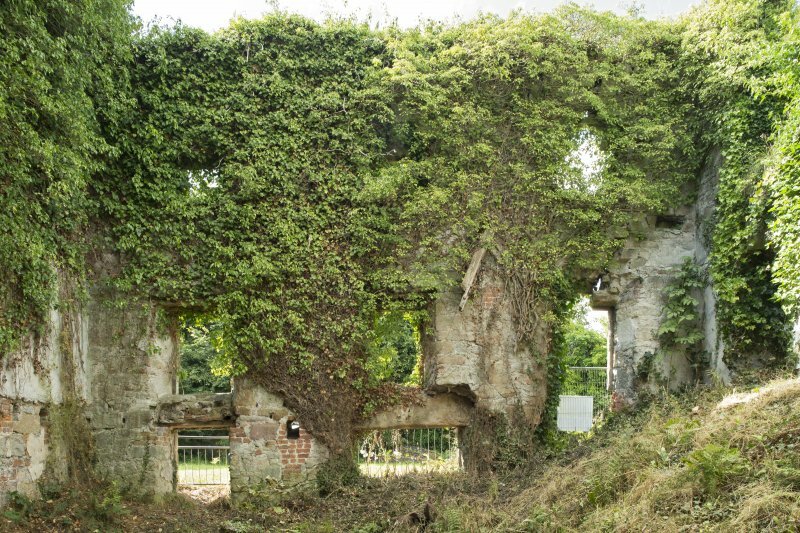 Many of the other buildings associated with the distillery - including the mansion house and Courts of Offices - were demolished in the 20th century. 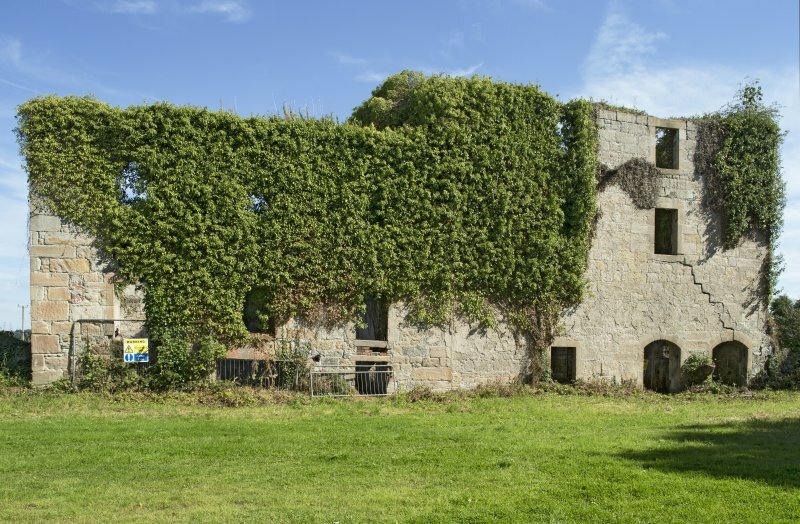 A detailed 3D laser scan survey of the exterior and interior of the distillery building was undertaken in addition to a detailed digital photographic record and historic building analysis. The building consists of eight distinct areas (labelled A - H) of various phases. 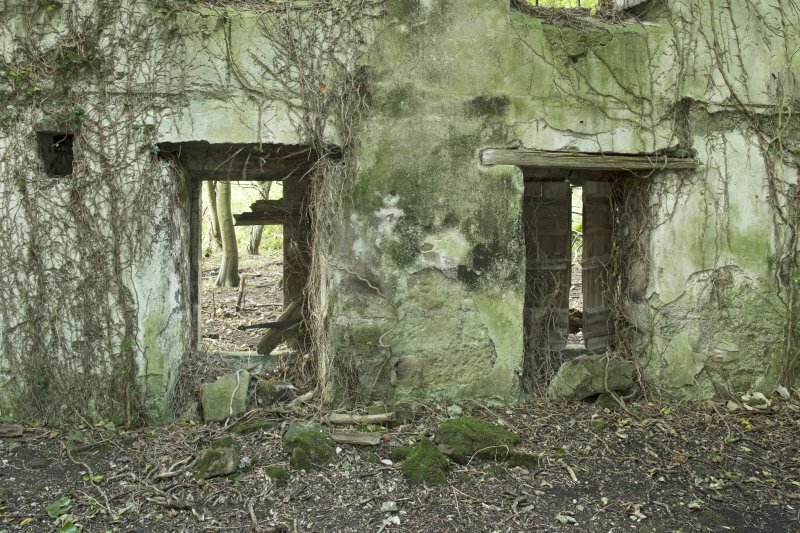 All buildings had become unroofed by the early 20th century, with all former machinery and internal furnishings removed or collapsed into the overgrown rubble which now makes up the ground surface. 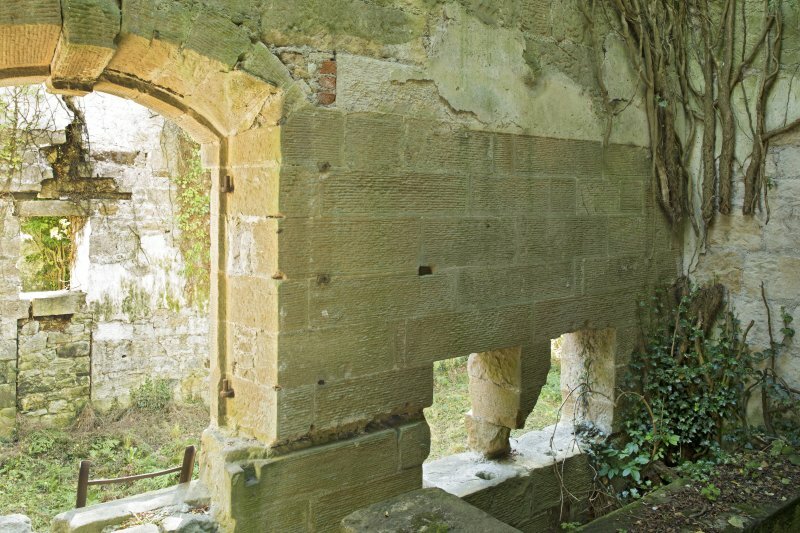 Only the remains of the original and later openings including doorways, windows, beam slots and roof scars, visible on the remaining stone walls. 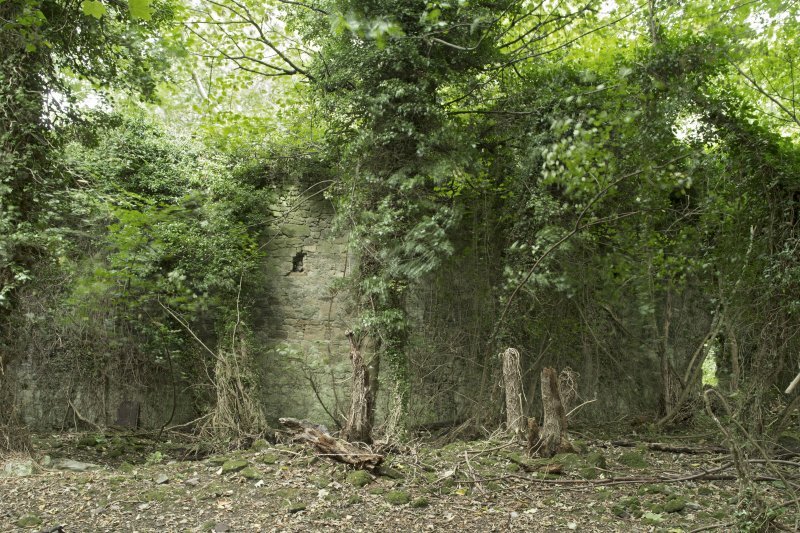 By the water's edge on the North bank of the River Forth, lie the enigmatic ruins of the once mighty Kennetpans whisky distillery. 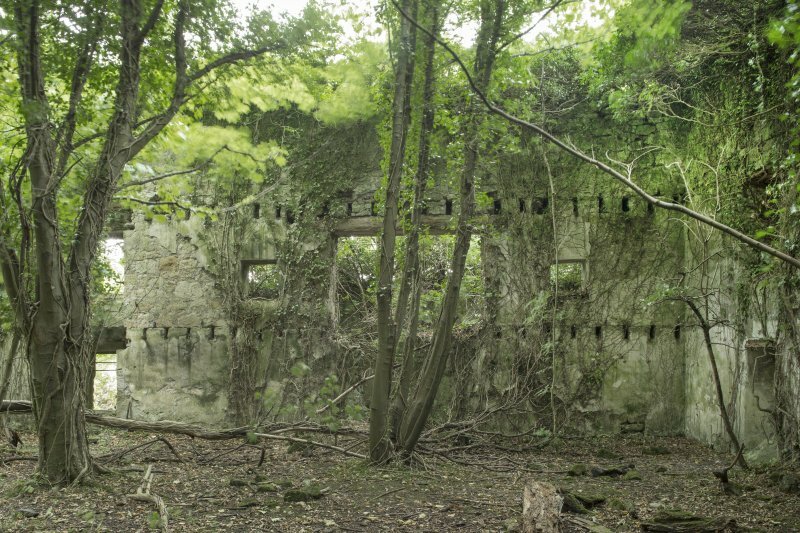 Established around 1777 by John Stein **, Kennetpans consumed locally produced grain and coal to produce distilled spirit, mostly for the London gin trade. The production of distilled spirits is universal and age-old. Distilling drinks from excess cereal harvests became commonplace in the late medieval period in the UK and elsewhere. Many countries have their own version of distilled alcoholic beverage widely known as 'aqua vitae'. Whisky is Scotland's version. 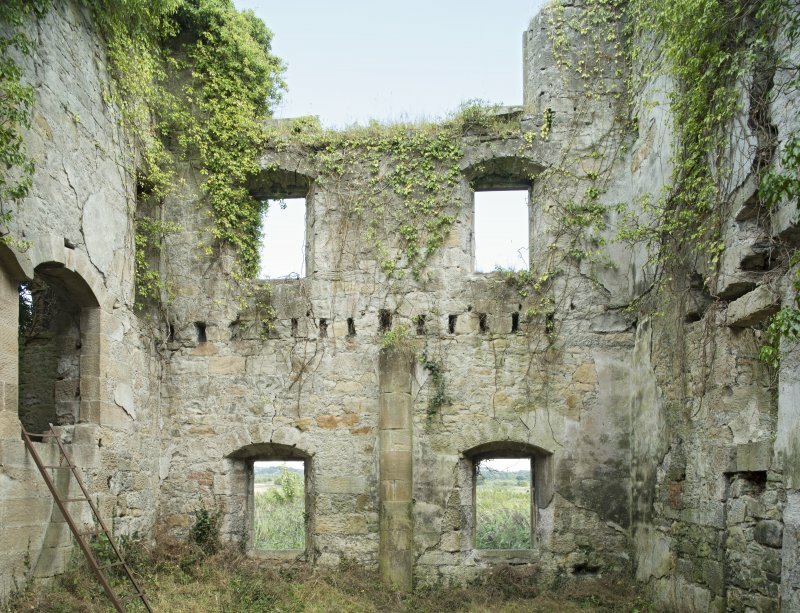 The industrial-scale production of whisky 'took off' in the 18th century. Whisky is now synonymous with Scotland - a market worth some £5 billion per year to the Scottish economy. 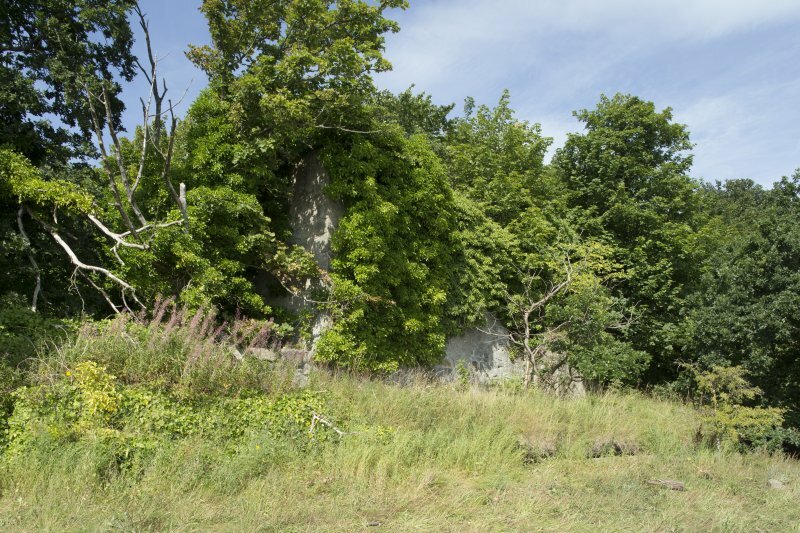 The Kennetpans site consists of the ruins of a once vast complex. 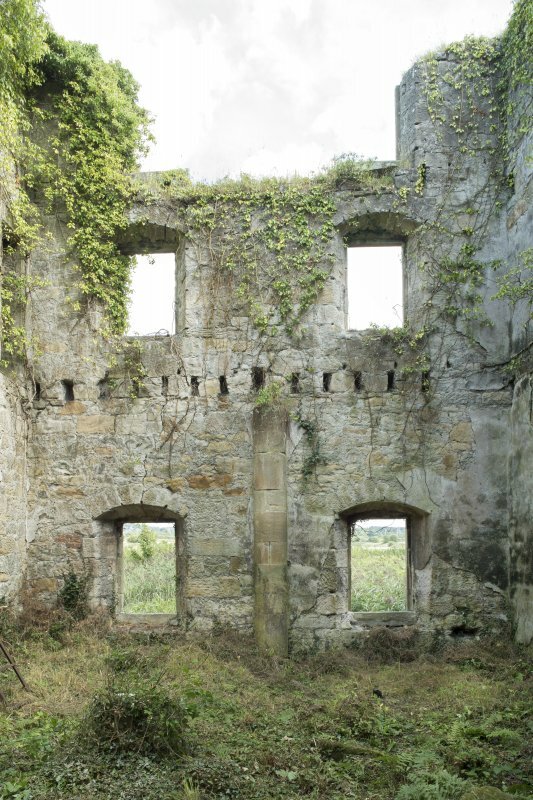 The main block, standing up to three storeys in height, would have been where the whisky was made. This was achieved by milling malted grain (usually barley) to produce a meal which was put through the 'mashing' process (the ground grain being heated in hot water, known as 'liquor' in the trade). The resulting liquid (wort) was then fermented, distilled and put into wooden casks (maturation process) for transport by water. Moving shipments by road in 18th century Scotland was extremely difficult due to their poor quality. 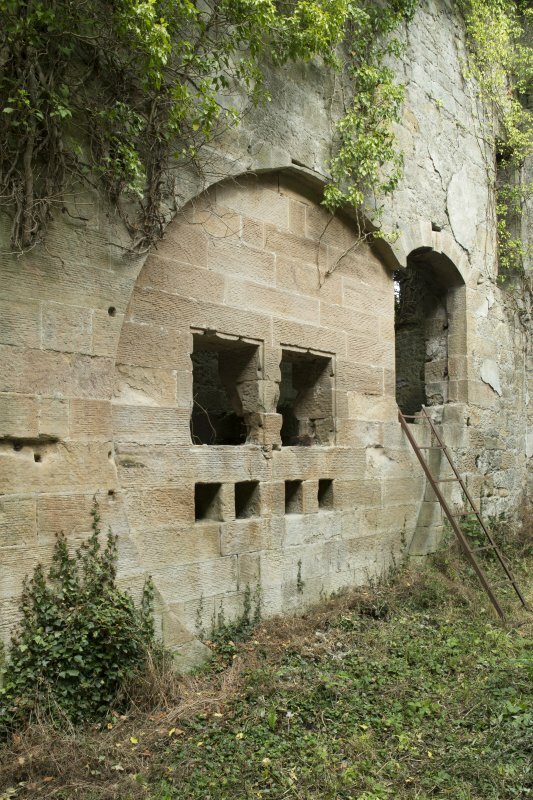 The rest of the complex consisted of kilns (where the grain was dried to halt germination), kiln stores (for the grain), workshops, and storage areas for empty casks. 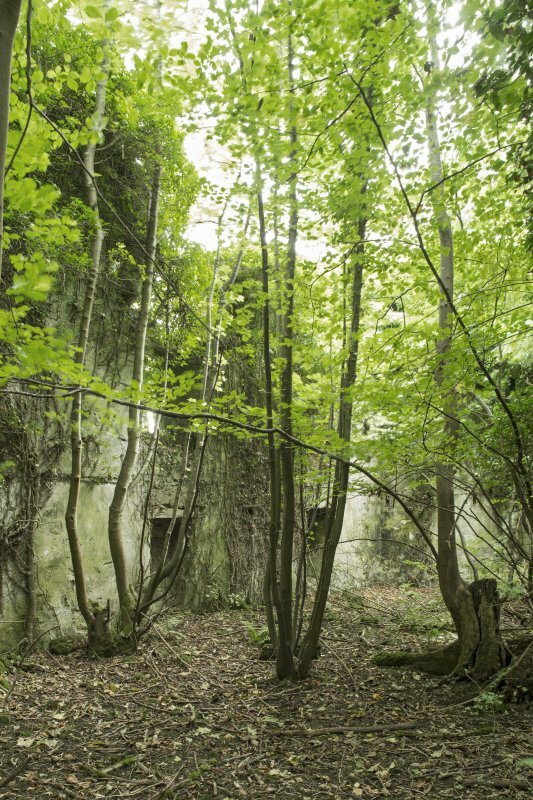 There were also secure warehouses in which the whisky would be kept prior to duty being paid as well as to ensure a supply ready to be dispatched to customers. 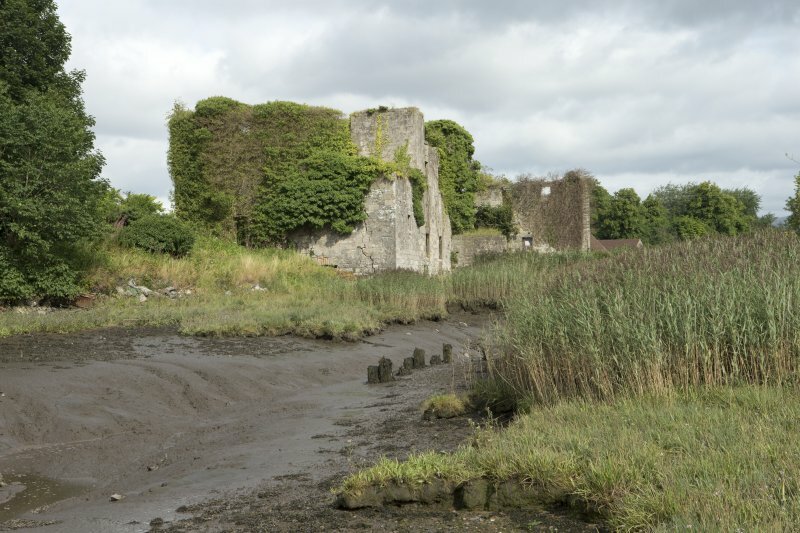 Along with the output of the nearby Stein family distillery at Kilbagie, the whisky produced was shipped out in barrels from the now silted up harbour at Kennetpans. 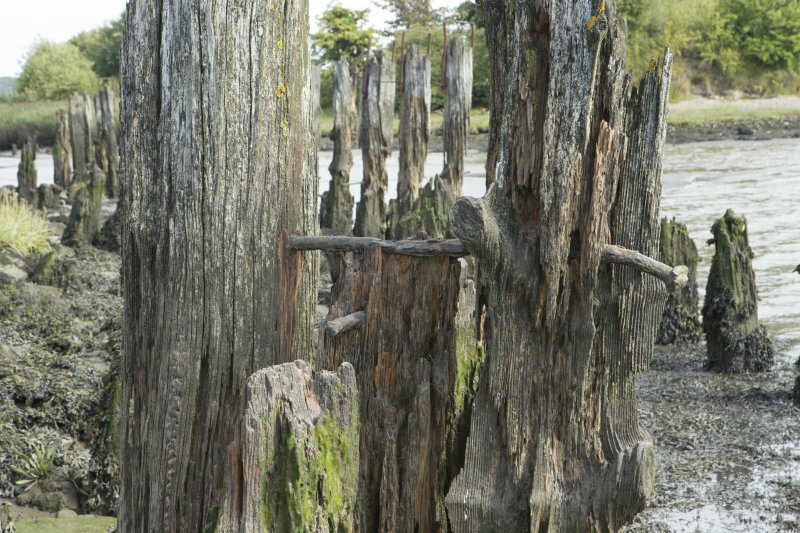 The former harbour and its wharves, represented by the remains of rotted wooden posts belying the scale of the enterprise, would have taken several ships at a time. 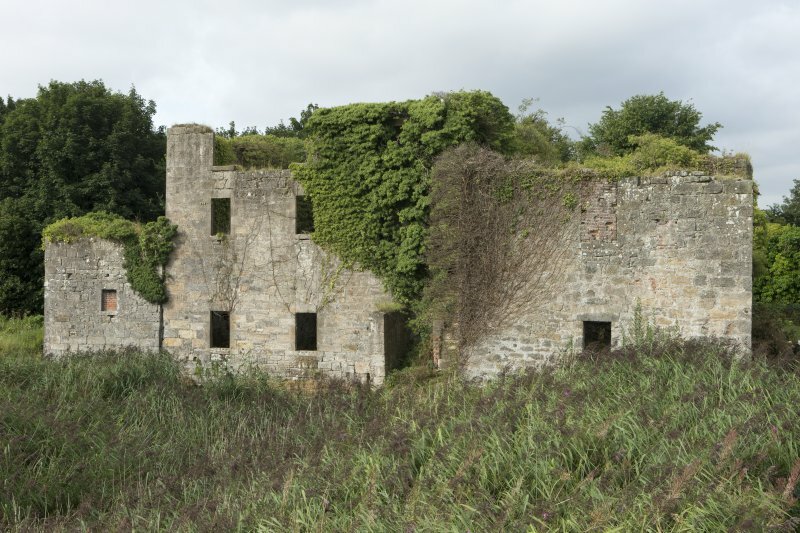 This industrial complex included a canal linking Kilbagie Distillery (the first distillery to export spirit in Scotland) and Kennetpans. This mile long canal can be traced in the landscape to this day. 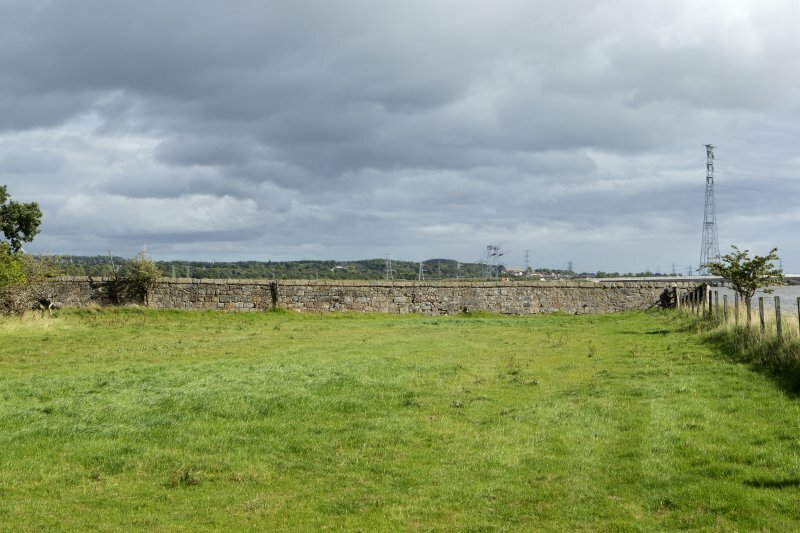 This part of the River Forth would have been a hive of activity in the late 18th century alongside the other harbours and wharves by the shores of the estuary. 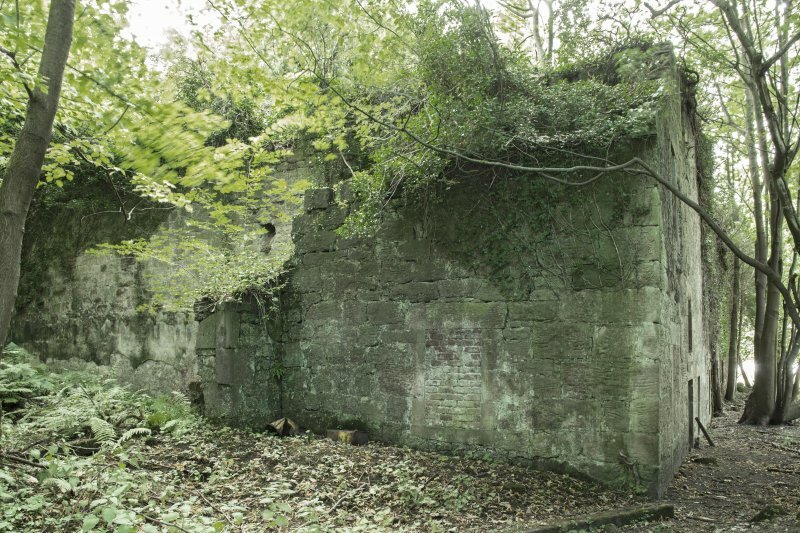 Kennetpans Distillery also had an early example of a Boulton and Watt steam engine (1786) which replaced a windmill used previously for grinding the kiln-dried malted barley. This engine was obtained from their Soho Works in Birmingham and was replaced by a second engine from the firm in 1806. Such engines were the cutting-edge technology of their time and iconic signifiers of what became termed the First Industrial Revolution. 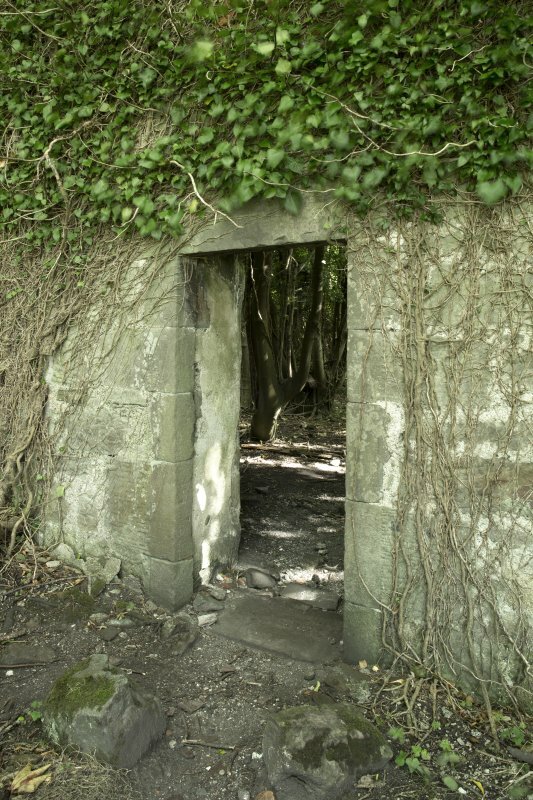 The whisky produced at Kennetpans, as at any distillery, was extremely valuable both to the producer and to the tax man. With the Act of Union in 1707, the tax on whisky and malt became permanent, encouraging evasion through the illicit trade. 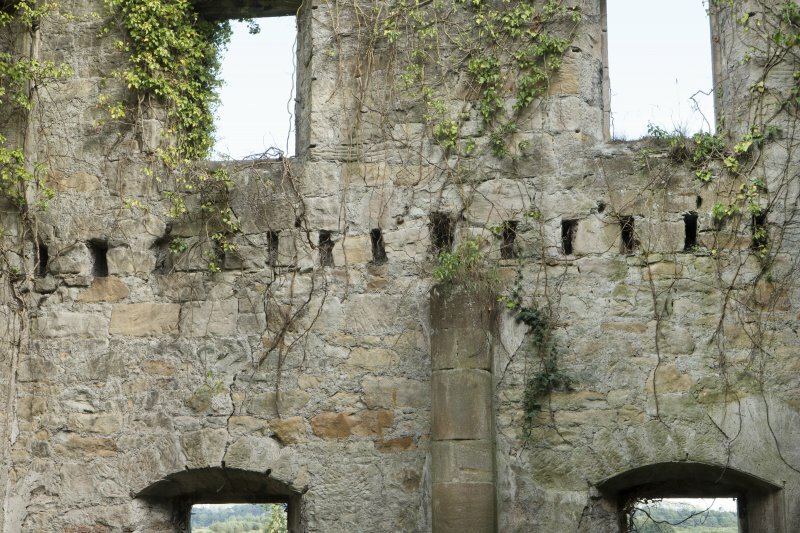 However, in the latter part of the 18th century, there was a dramatic growth of exports to England for all Scottish distillers, including the Steins. 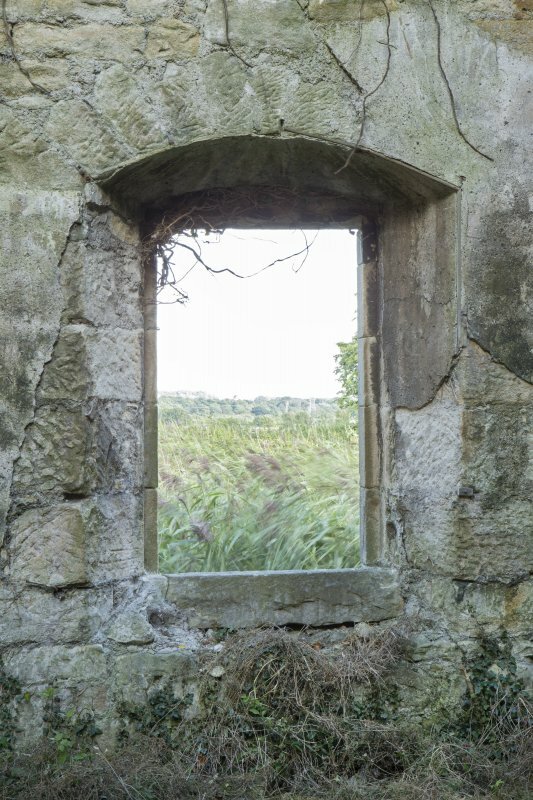 By 1788, the export tax on Kilbagie and Kennetpans (levied on spirits sent to the English market) was greater than the total land tax for the whole of Scotland. Changes in the taxation laws during this era increased the returns to the Exchequer, but trammelled the whisky producers in Scotland. At the same time, English spirit traders lobbied the Parliament at Westminster to do something about the volumes of whisky flowing into London resulting from the booming Lowland whisky production. 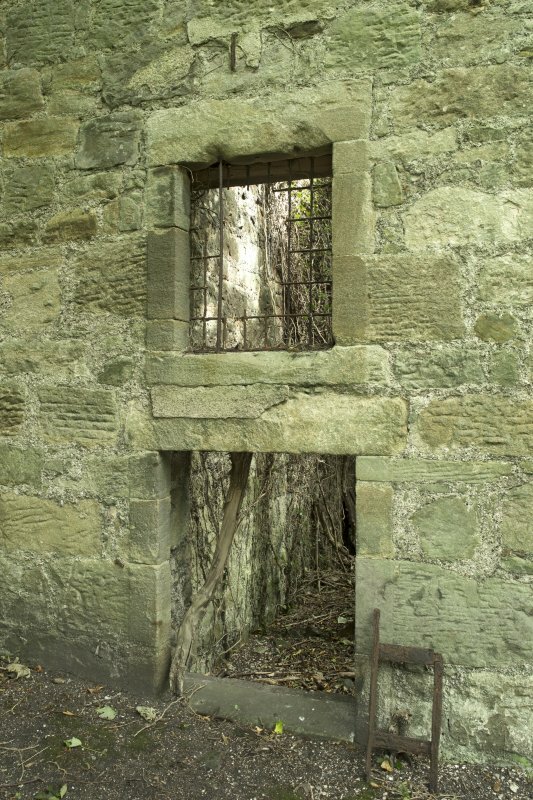 When times were hard, distilleries would be sequestrated, as happened at Kennetpans in 1788, when the Lowland Licence Act stopped the making of whisky for 12 months at all Scottish lowland distilleries supplying the English trade. 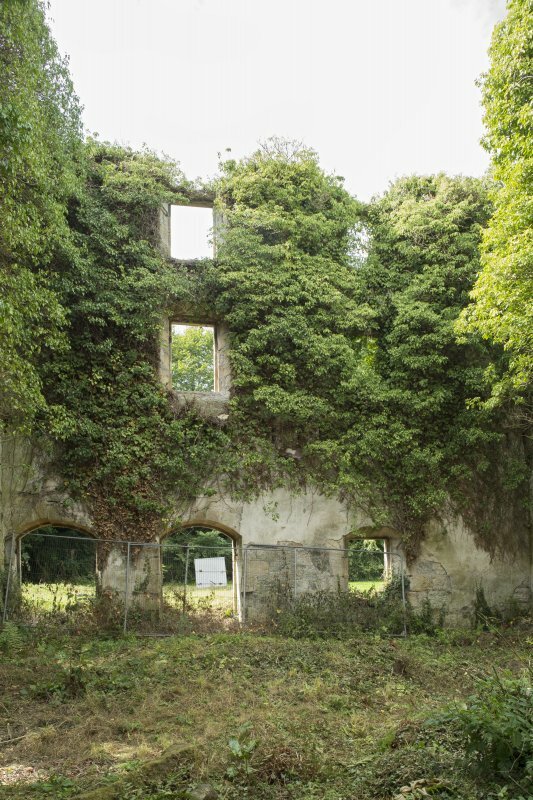 Kennetpans reopened in 1791 after it was bought by two businessmen and leased back to John Stein Junior. 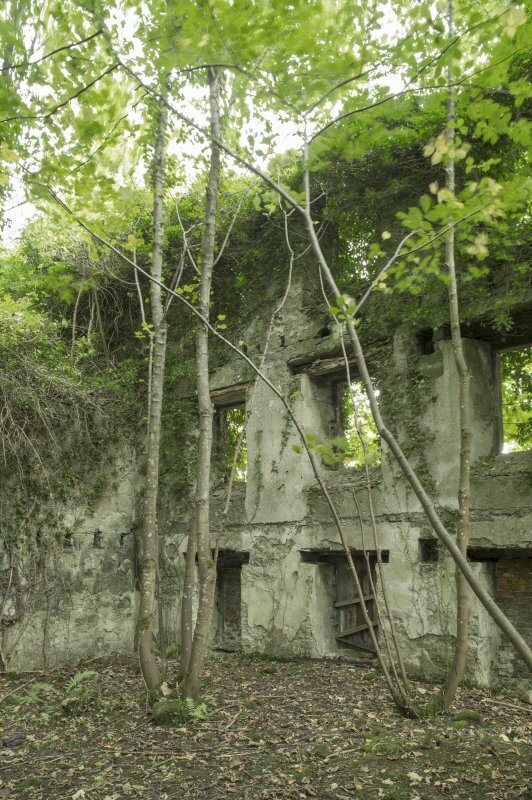 The Distillery finally closed after John Stein died in 1825. 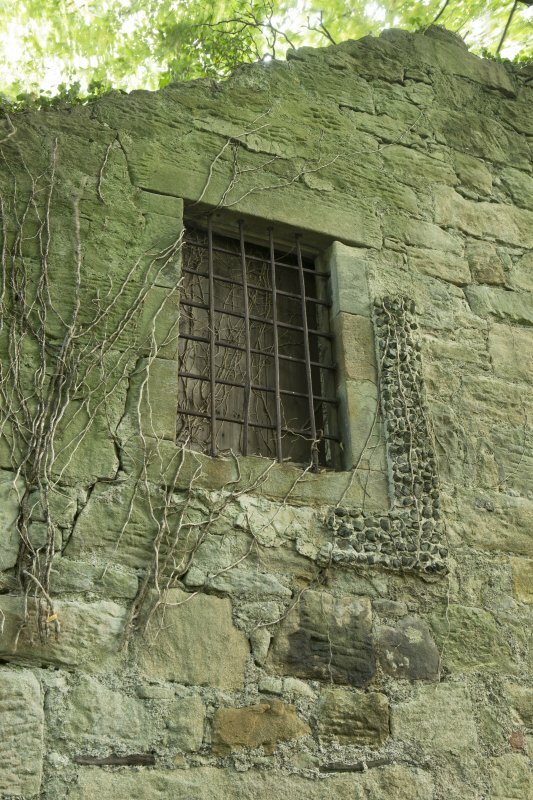 Bribery and corruption was also a part of the whisky story in the 18th century. 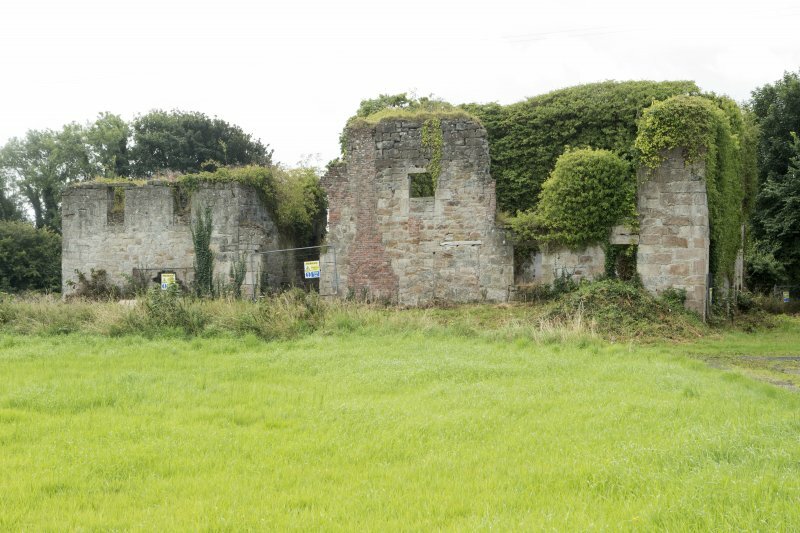 One such scandal directly touched Kennetpans and the Kilbagie Distillery. The County Magazine reports on a trial that took place at the High Court in 1786, where James Stein of Kilbagie Distillery 'stood indicted ...for the crime of bribing, or attempting to bribe, Mr John Bonnar, Solicitor of Excise, by thrusting into his pocket, on the 2[n]d of September 1785, a paper parcel, containing 500l. sterling, in Bank notes, with the following words wrote on the inside of the cover, 'this is to be repeated once a year'.' The jury found that 'the delivery of 500l. sterling to Mr John Bonnar proven; but do not find the intention of seducing and corrupting the said John Bonnar proven.' One could say that James Stein was extremely lucky: tax evasion and bribery charges against distillers were not unknown at this time. He, in his turn, sued for lost business. Chutzpah, indeed! 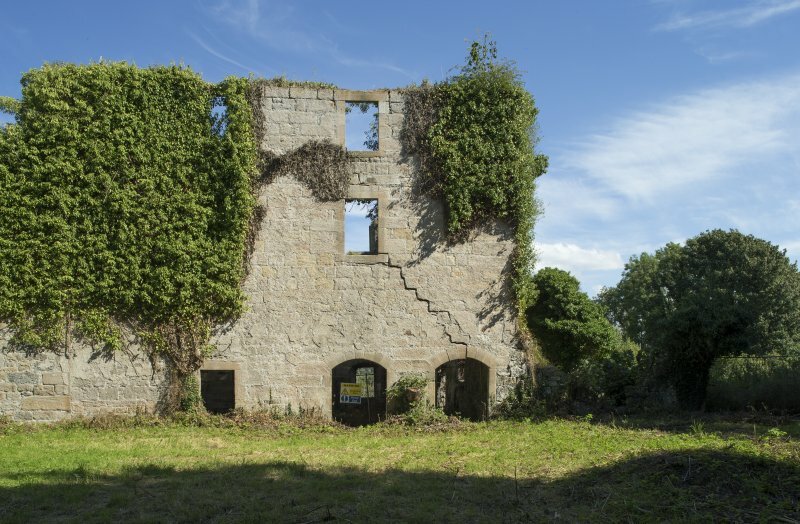 Today the ruins of Kennetpans are in a parlous state but they are perhaps more intact than those of any other late 18th century distillery in Scotland. 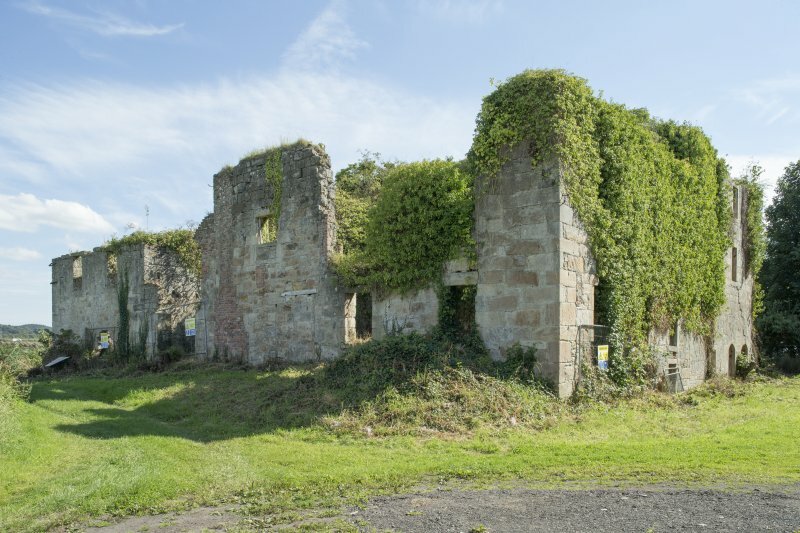 The present owners of the Kennetpans Distillery complex are keen to celebrate and publicise this 'forgotten' industrial venture with the setting up of a local Trust and the remains were designated as a Scheduled Monument in 1991. * 'Whisky' has been corrupted from the Gaelic, usquebae (various spellings) and is the equivalent of aqua vitae or 'water of life' - a generic term for distilled alcoholic beverages. Aqua vitae were originally taken as a tonic, although the convivial effects of drinking the 'tonic' no doubt soon outstripped its imagined medicinal value. 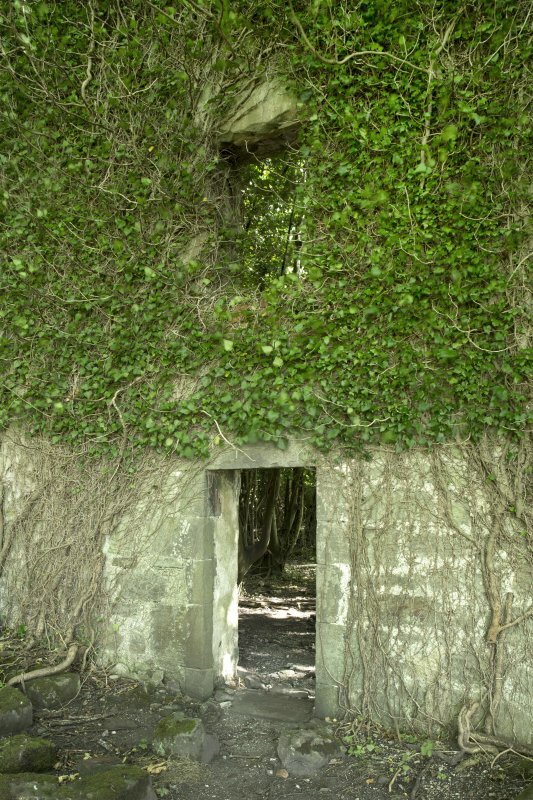 **John's brother, James, founded the Kilbagie Distillery, a mile to the north, around the same time. 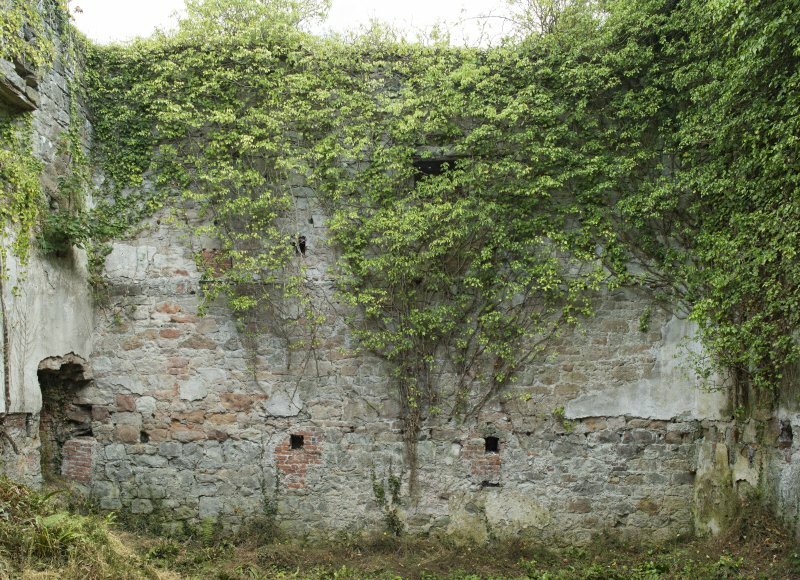 During the late 18th century, the Stein family ( or rather the Stein dynasty) owned and operated the Kilbagie and Kennetpans distilleries in Clackmannanshire, the Canonmills and Lochrin distilleries in Edinburgh and the Kincaple distillery in Fife. 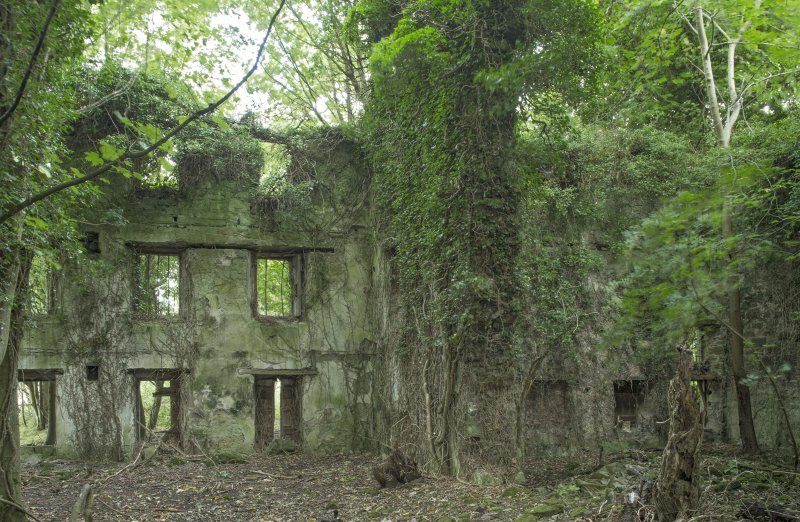 They controlled a significant chunk of both the whisky-making and whisky trade in Scotland at this time - along with the Haigs, who married into the Stein family in the 1750s.